Hi. Been a while, and I’ve been busy. 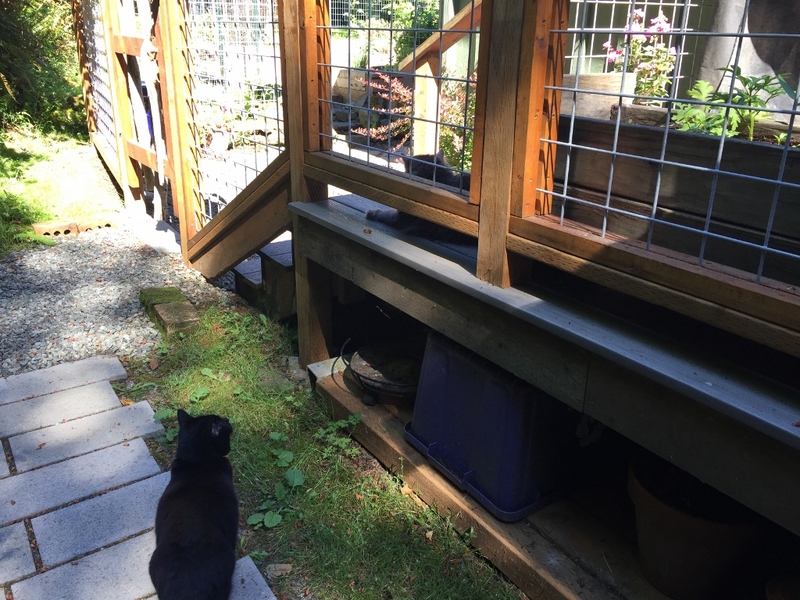 The house itself is (mostly)* done (sort of) and so my attention has been turning to outside. 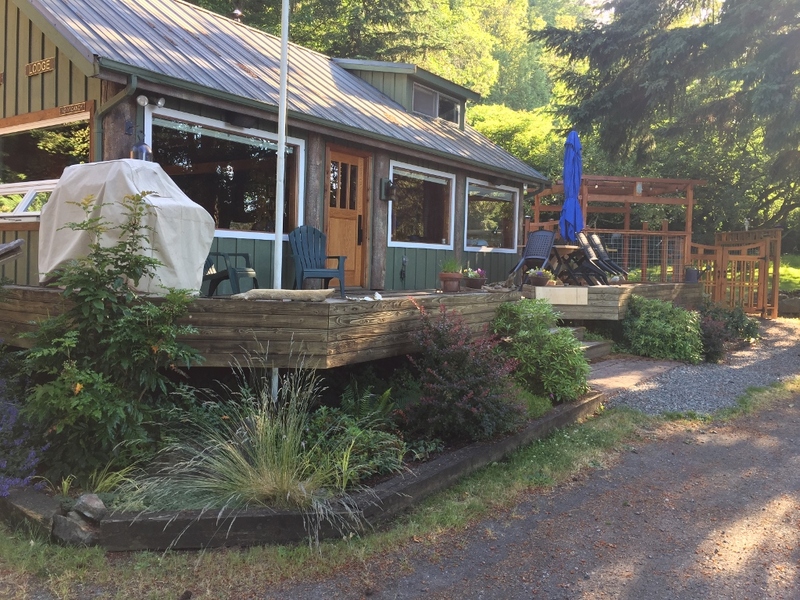 Lots of gardening and landscaping, and a fun project or two thrown in for good measure. Let’s take a look. 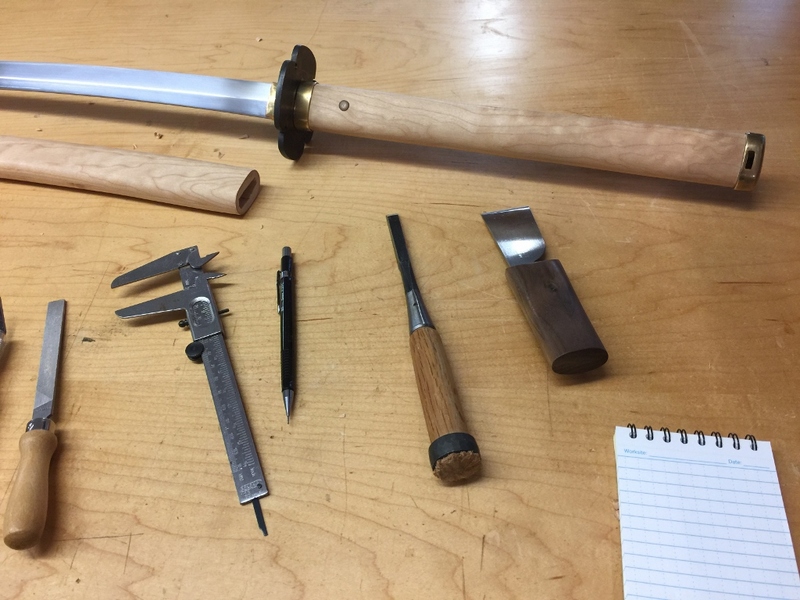 Sword making and restoration is not easy, but it’s fun. 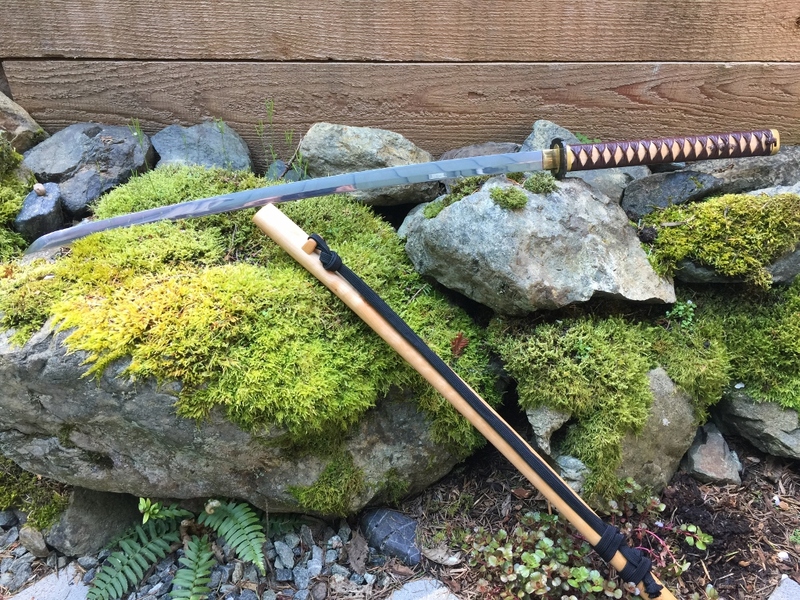 I made all new fittings for an old katana. Used curly maple for the handle and saya. Came out great. The restored sword is light, quick, and very sharp. Good grip. Good balance. Very much ready for the zombie apocalypse. 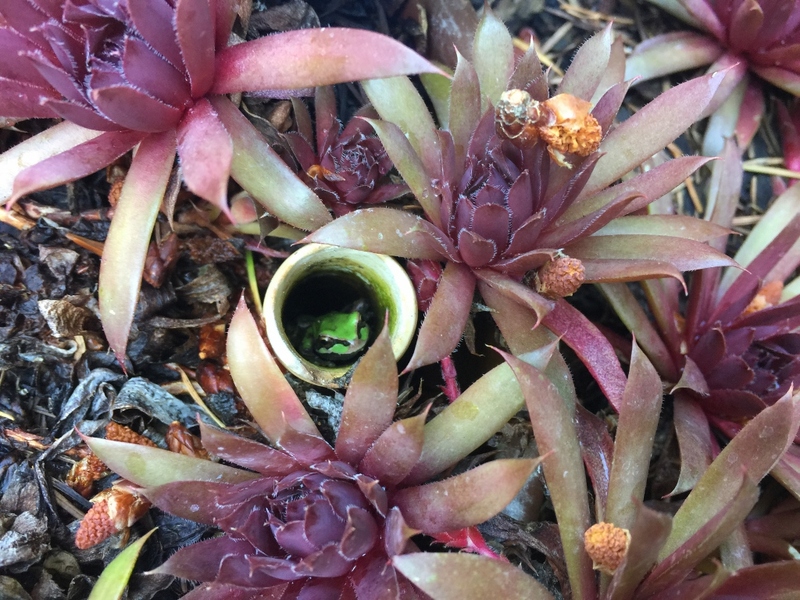 We have frogs in our garden. 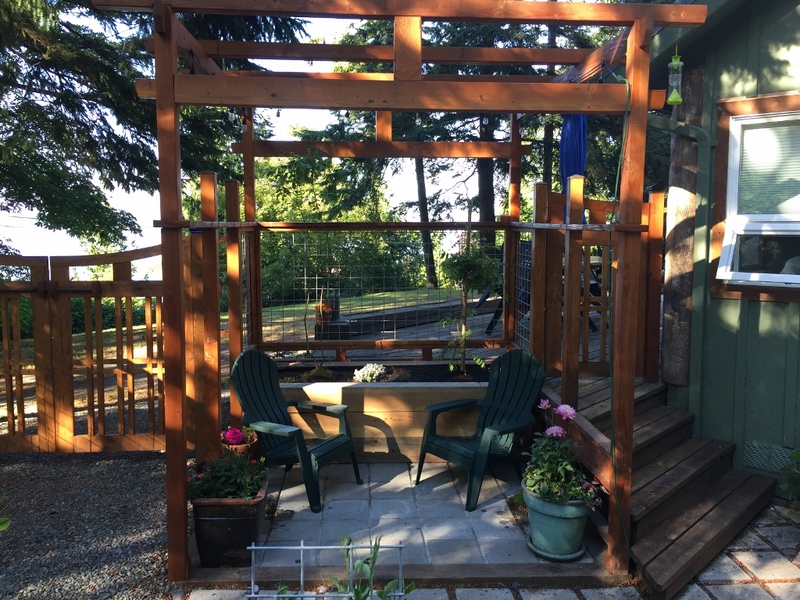 The pergola has kind of turned into a little shrine for relaxation and watching the world go by. I should spend more time there, I know. 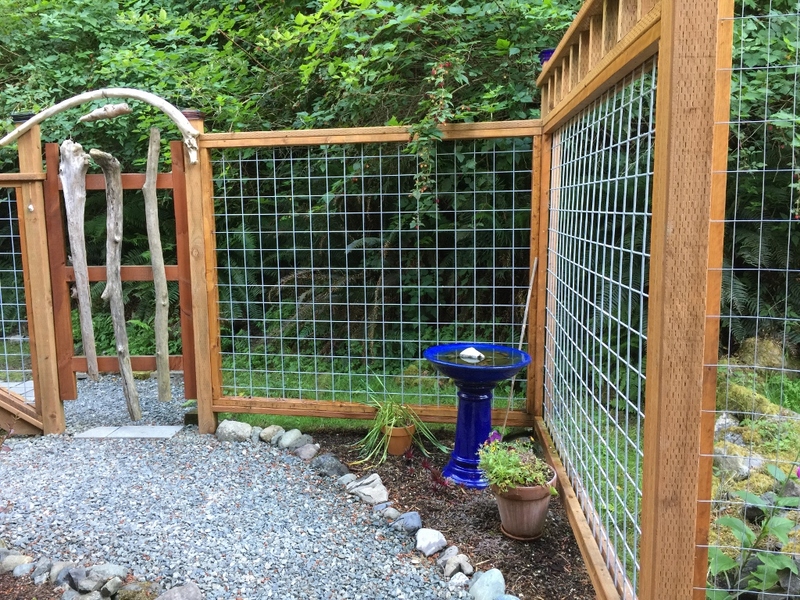 I put a wisteria in that planter bed behind the chairs, it should grow into the pergola nicely. 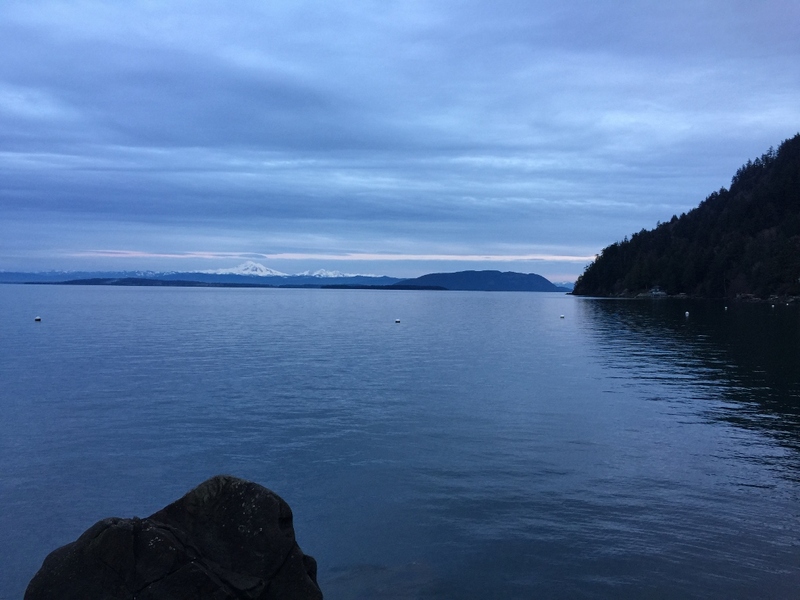 It’s such a nice place to sit and stare at the water. 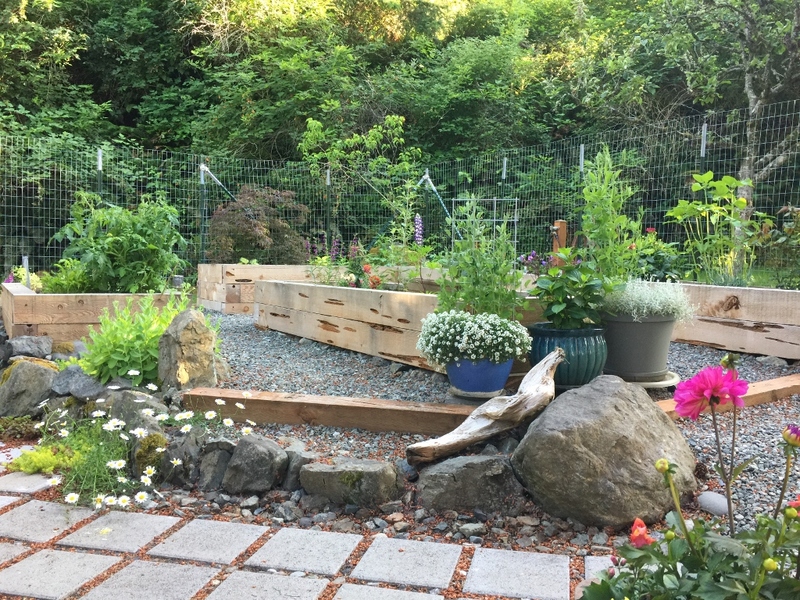 Front planting beds are doing great. 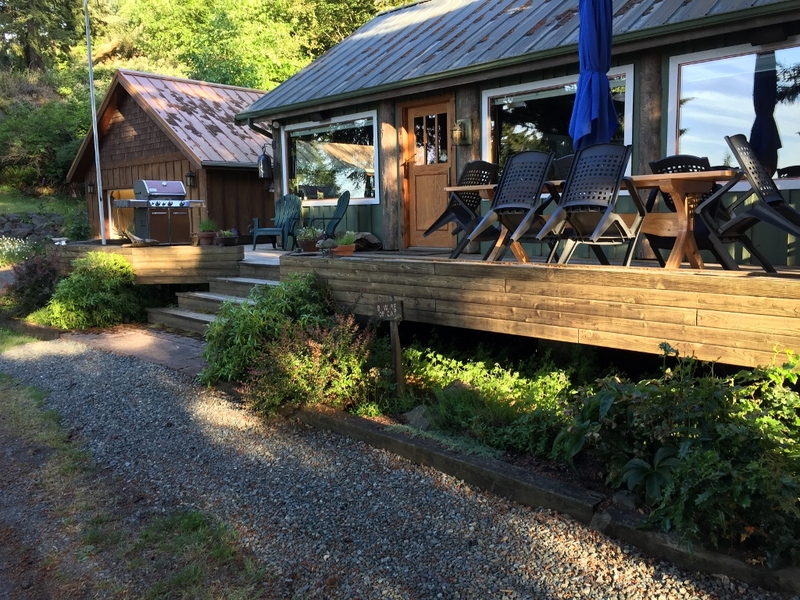 Up the hill is where the shed is, and it’s like the Final Frontier. The last untouched remnant of the old house is up there, because except for the green paint that shed is just about how we found it. 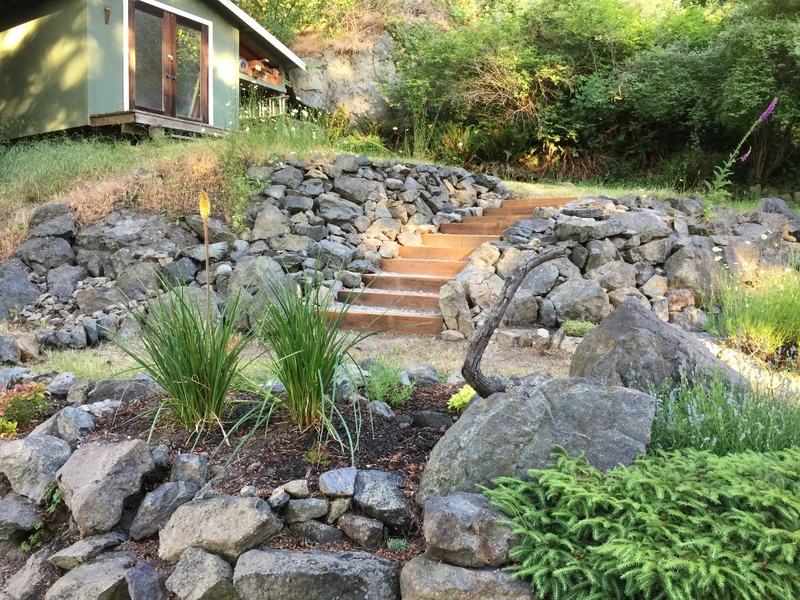 I made those stairs going up the rocks, and soon I’ll be putting a new deck up there and making the shed look nice. 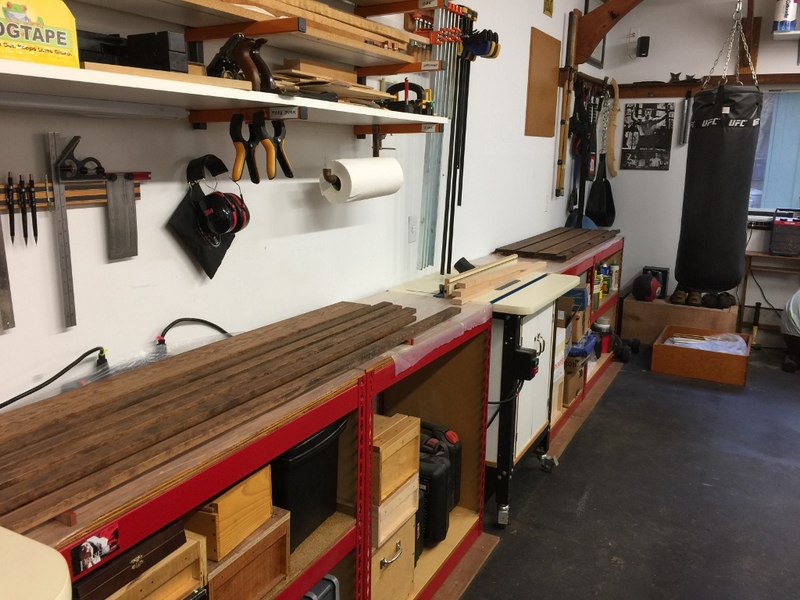 The shop is looking great. Cabinets are all finished. 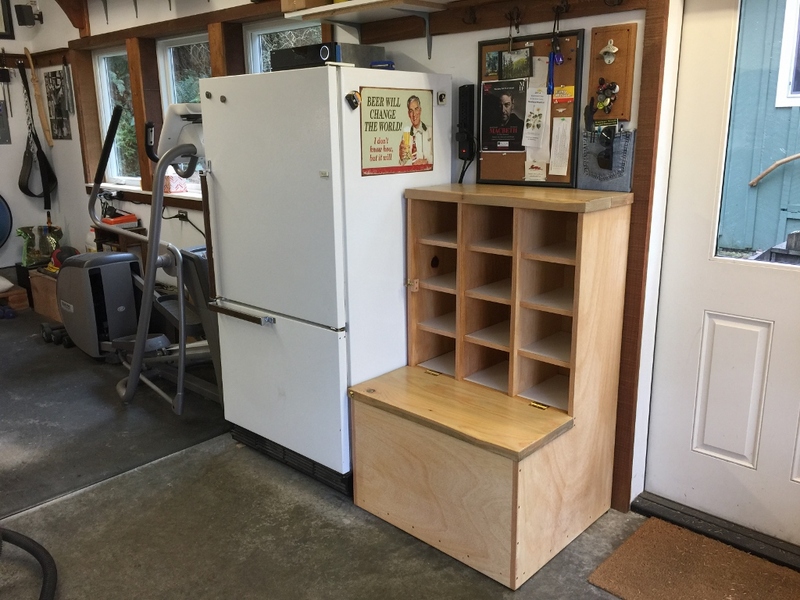 I did the math: it’s 102 cubic feet of cabinet space that I added to the shop. 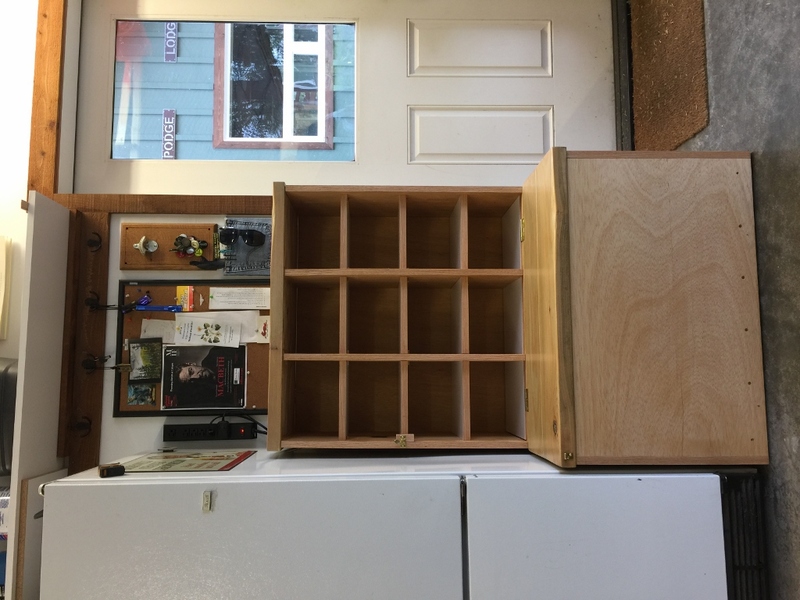 I added a TV to the shop. It’s great during hockey season. It also swings around so you can watch it while on the elliptical. And I found some cool cabinet knobs. 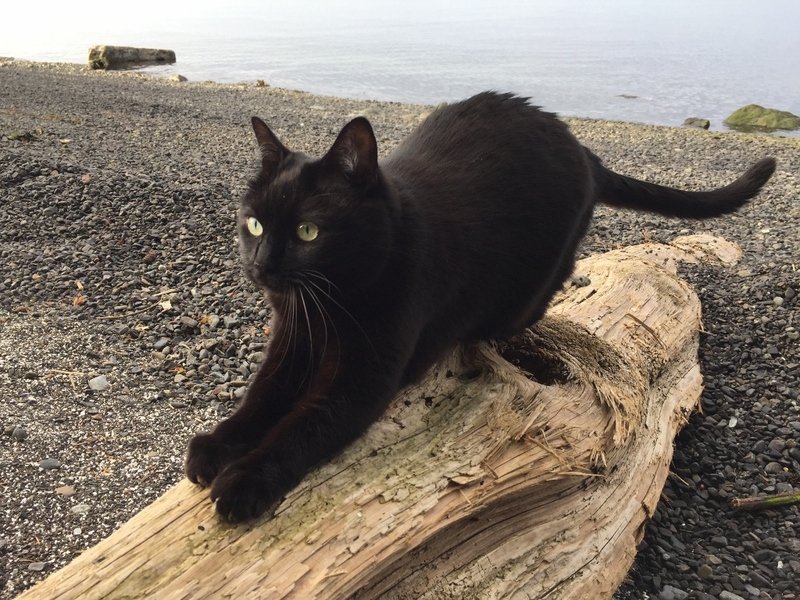 Inky likes the beach. It has the biggest scratching posts. 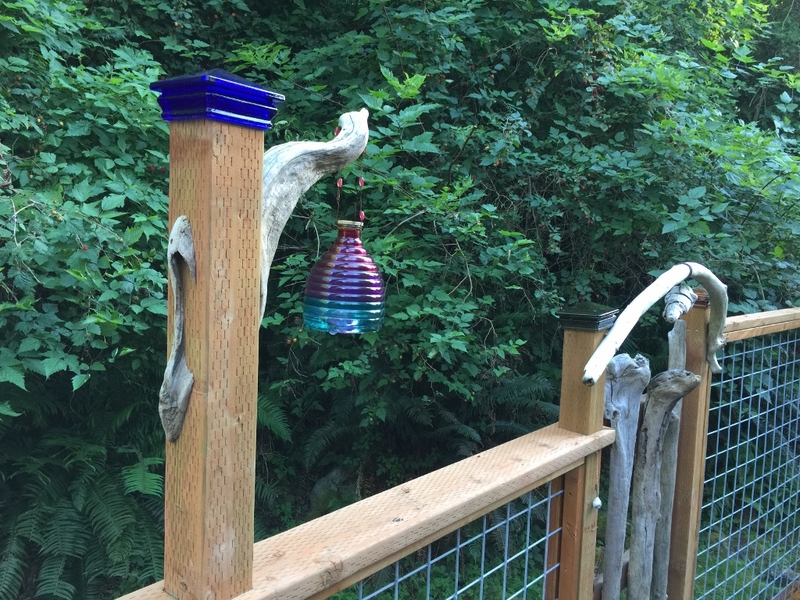 Posted in Critters, Garden and Landscaping, House, Renovation, Shop	| Tagged Y'all come back now ya hear? 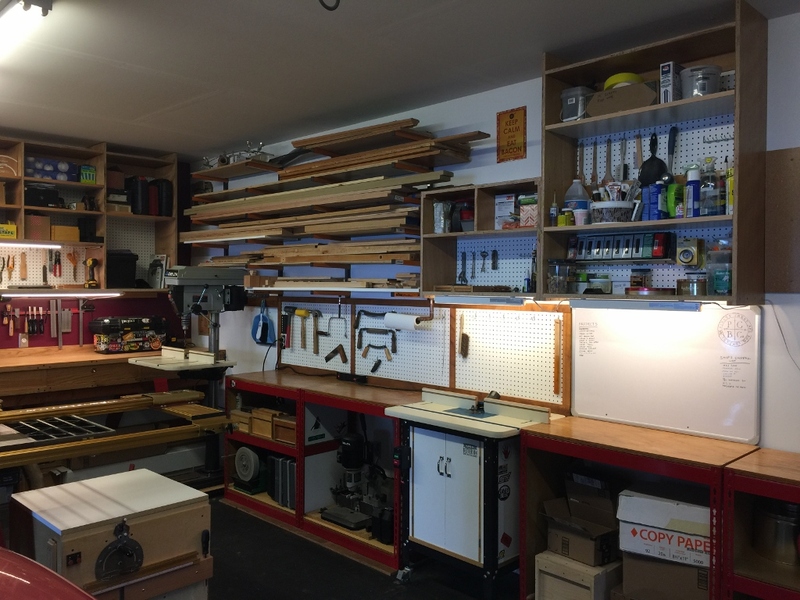 My shop needed some organization. I didn’t realize until now how hastily put together everything was. 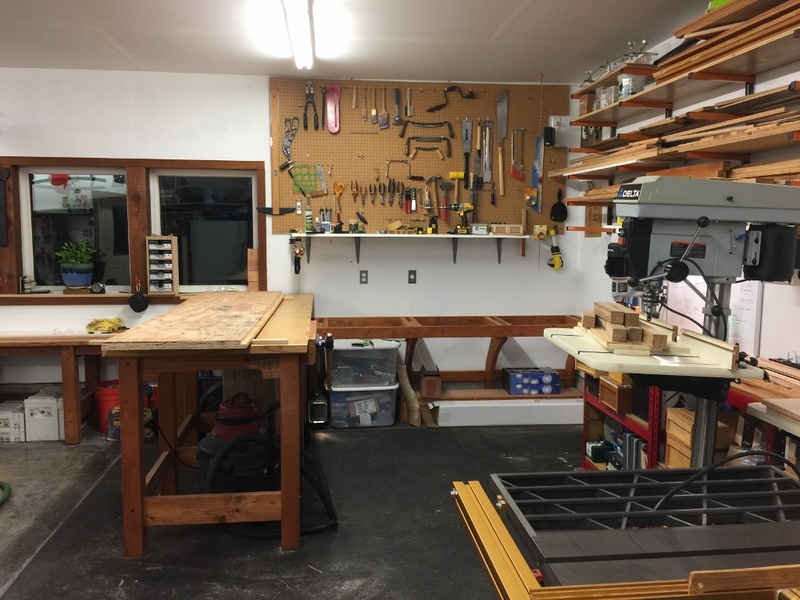 I didn’t have any time to spend on the shop because I needed to get the house put together. Now that the house is habitable and, dare I say, finished, it’s time to make some storage and organization out there. I have so many homeless, orphan tools in boxes and I don’t even know where they are. Several times I’ve bought a duplicate tool because I forgot I had it. Well, now, maybe some places to put things so that they’re accessible, it’ll help. 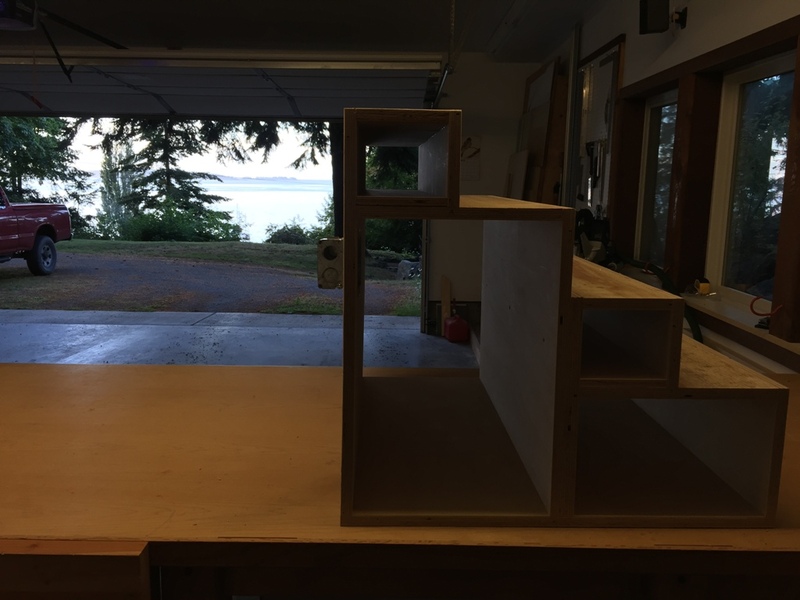 As part of all this, I’m raising the heights of my side tables a bit, and to do that I’ll build some drawers to go on top of them. 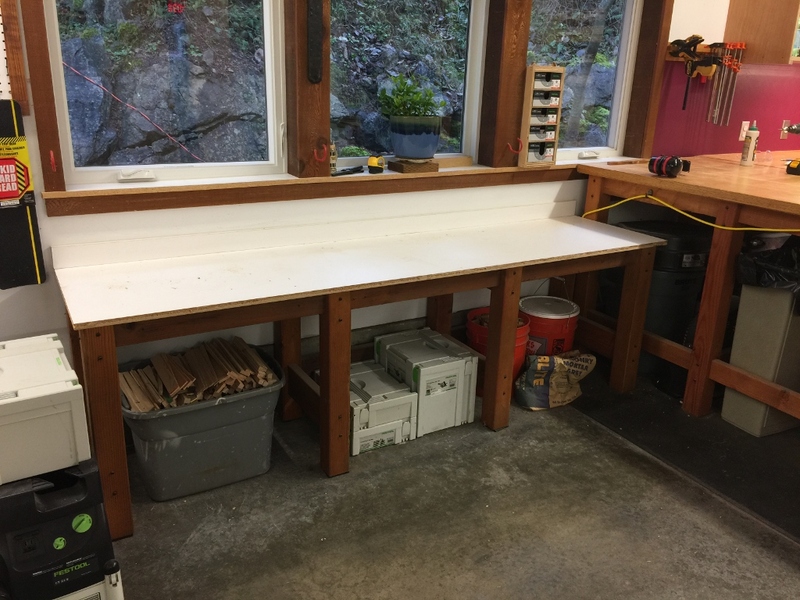 I’ll get more storage space, and I’ll be able to use all the tables to support large pieces of wood when I’m cutting them. 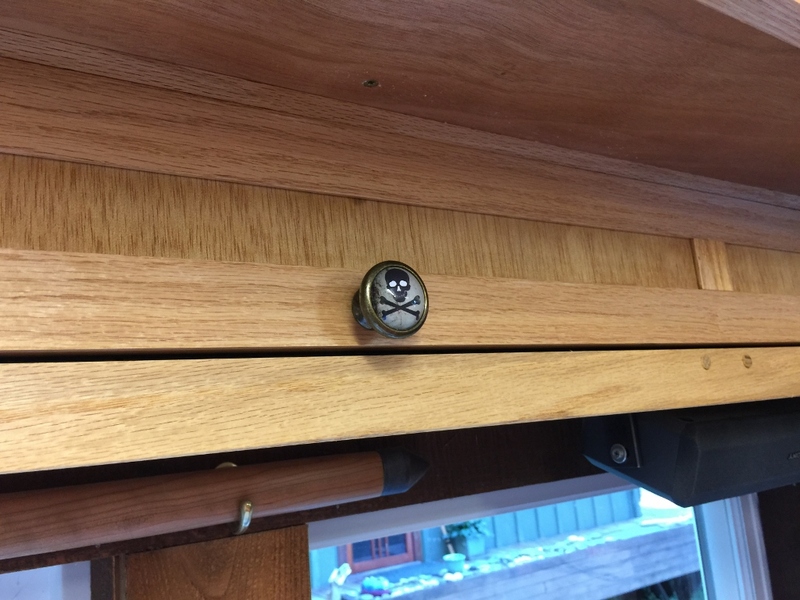 It’s easy to install the drawer hardware if you do it before everything’s assembled. 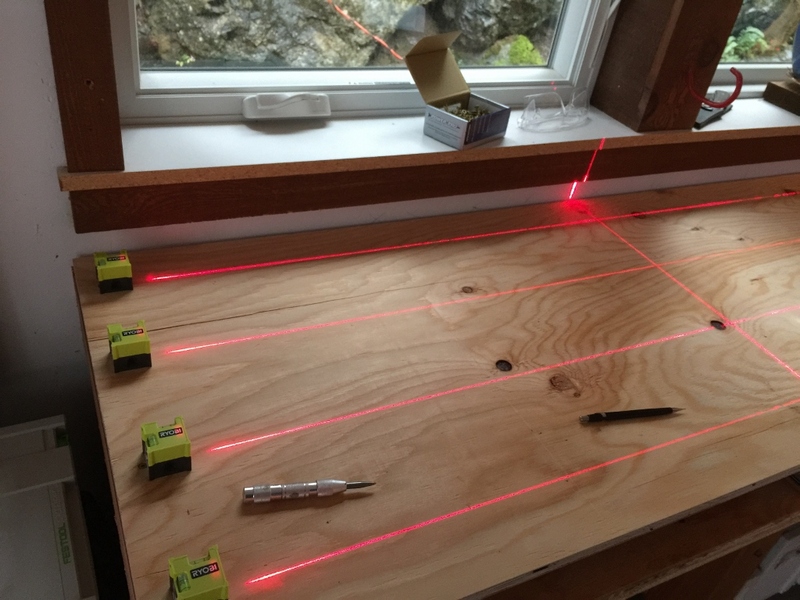 Not sure if lasers make anything any easier, but it is more fun. 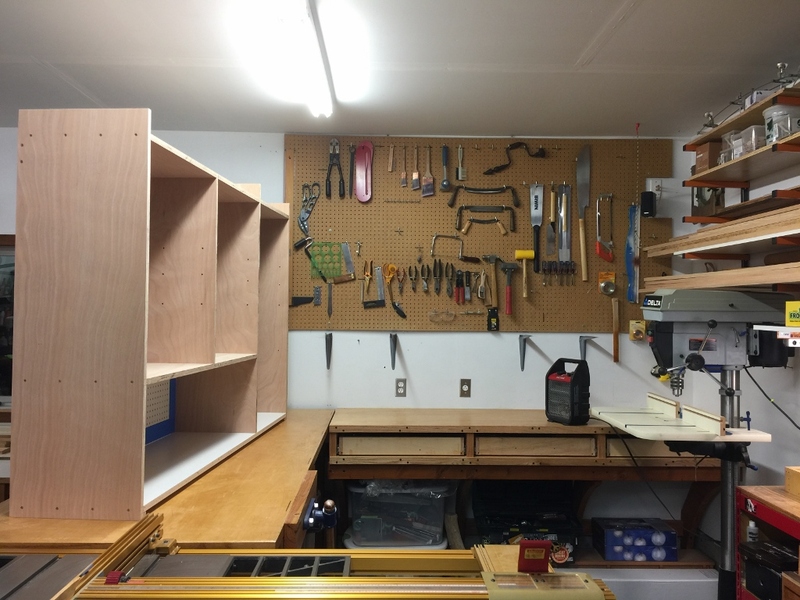 The drawers are pretty solid, and I made some partitions in front to help sort things out. It’s a pain to do, but worth it in the end. Now I’ve got a little Festool work station going on. 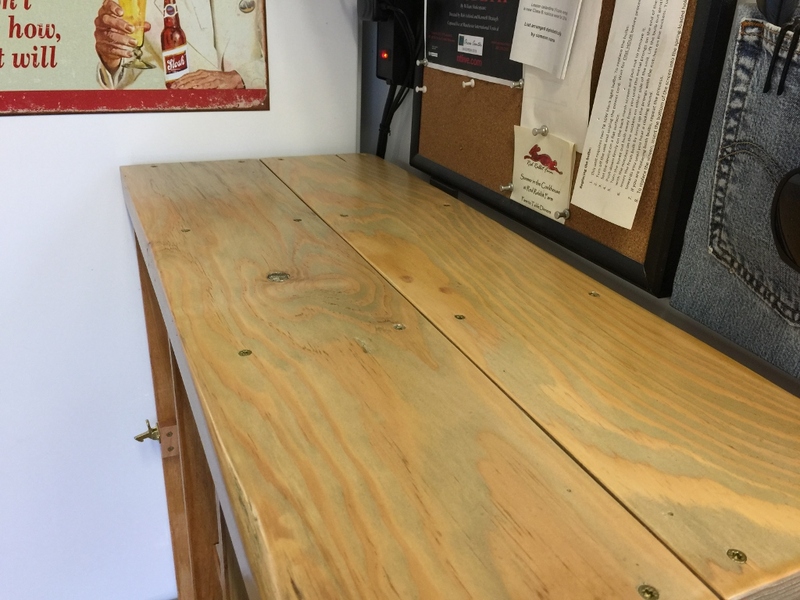 And when I put a piece of wood on that saw, it’s the same height as the tables over to the right, so I can cut large pieces and they’re fully supported. A little paint along this wall made a big difference. Every once in a while, I open an old cardboard box and find some torn up cardboard and a small pile of cat food. 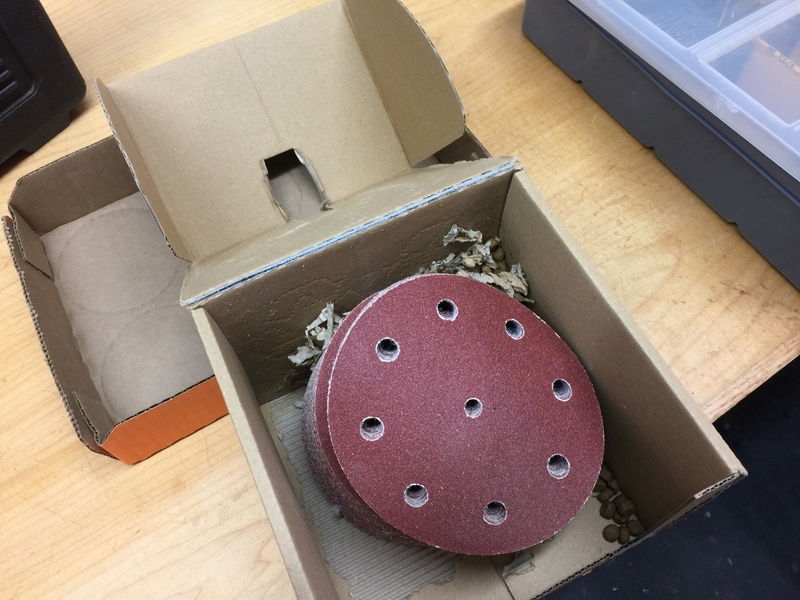 A mouse was nesting in this box. 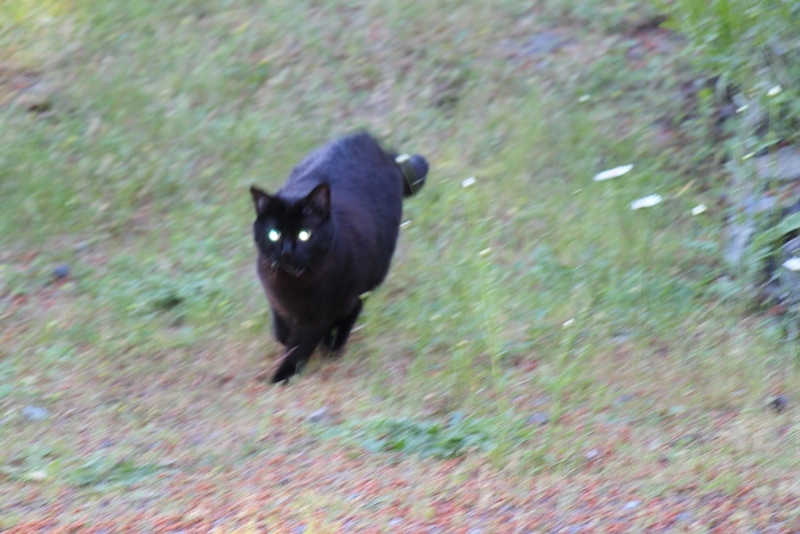 I think he was gathering cat food to have enough to survive a zombie apocalypse. 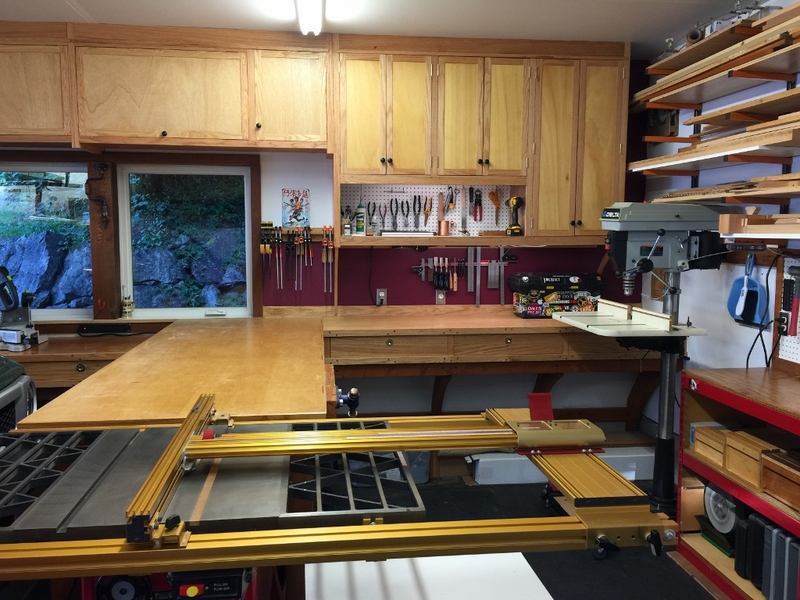 More cabinets went up over the router table. Even more cabinets. And no, I’m not done. I still have about 22 square feet of wall space I can cover with more cabinets. 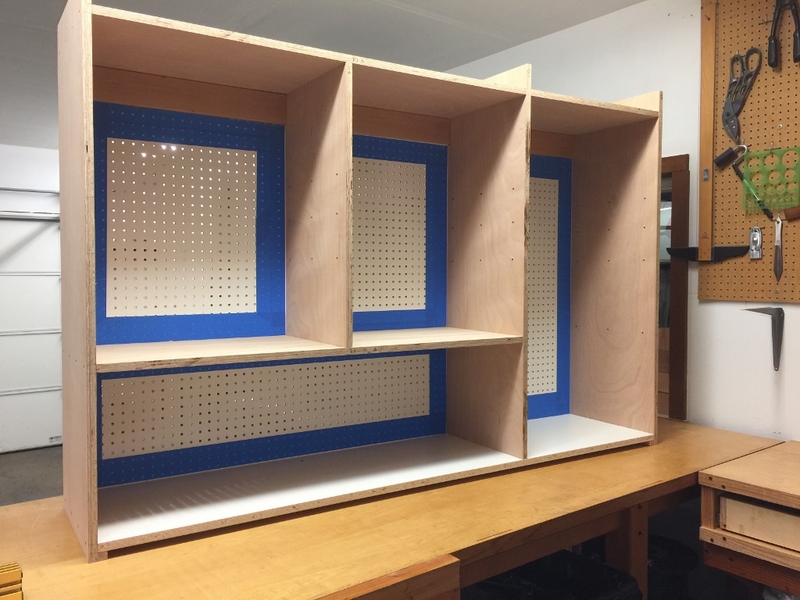 Yeah, I know, I get more excited about shop cabinets than most people do, or should. 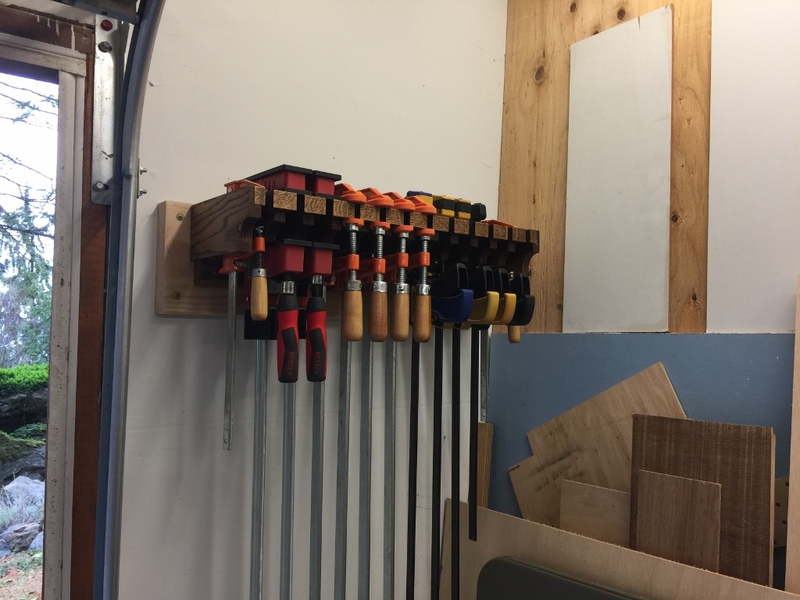 I’ve been badly in need of a new clamp rack. Of course, I make the biggest, heaviest monster clamp rack that I can. 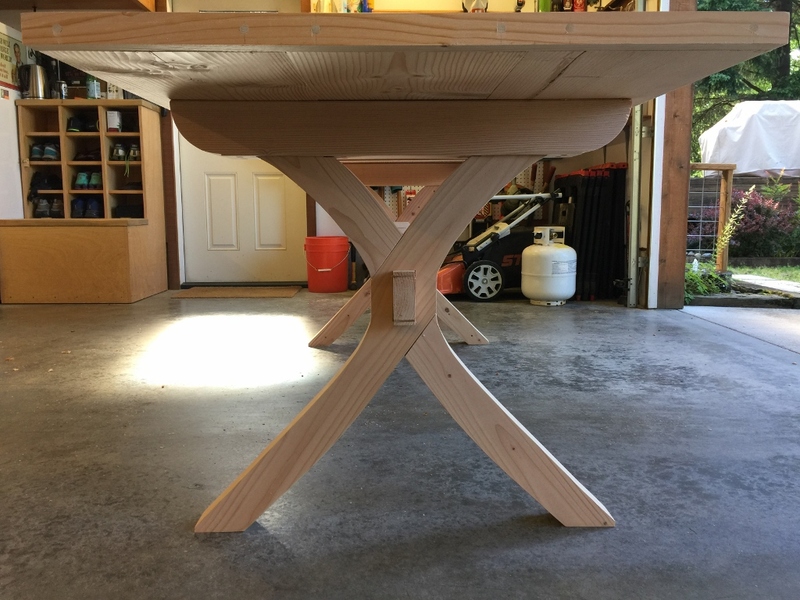 The top is 1″ thick solid oak and because I didn’t think that was strong enough I put some 1.5″ thick brackets underneath to reinforce them. Unfortunately, no room for expansion. 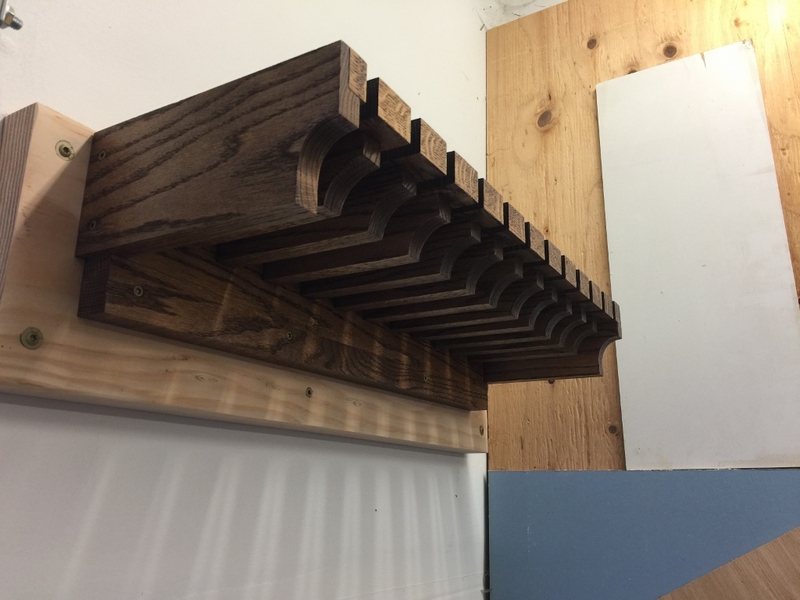 But that’s okay, there’s no room for another clamp rack in the shop. 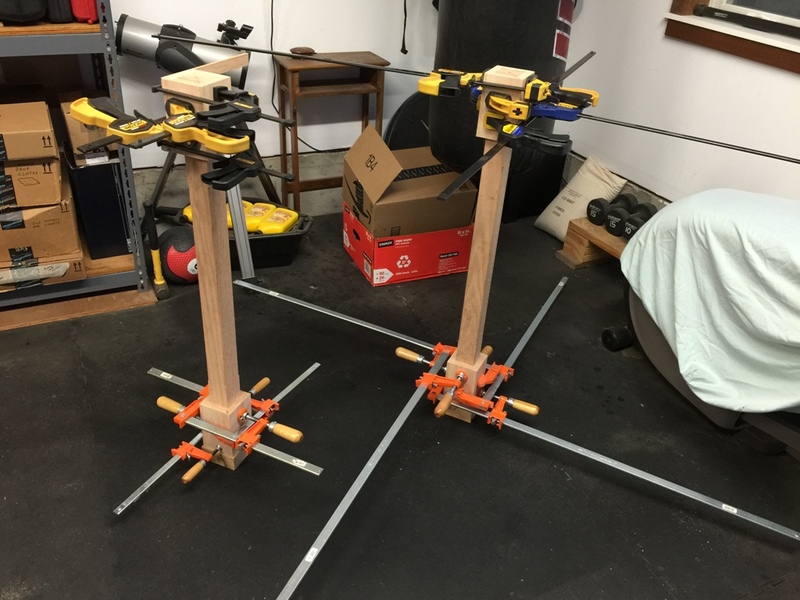 Well, I’ll have a separate rack for small clamps. So, I have this little side table along that back wall, you can see it here with the brackets underneath. 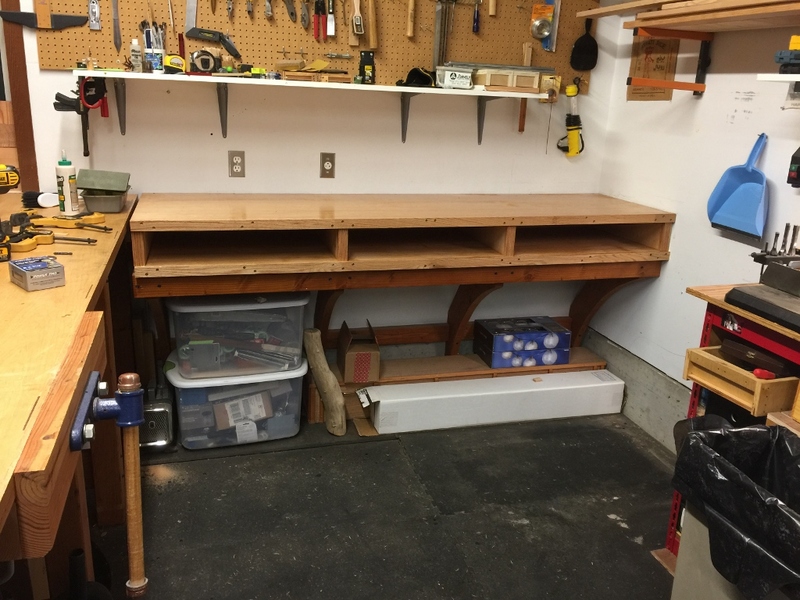 I’m reworking some storage and work surfaces in the shop and I wanted to raise that side table to the same height as the main bench. 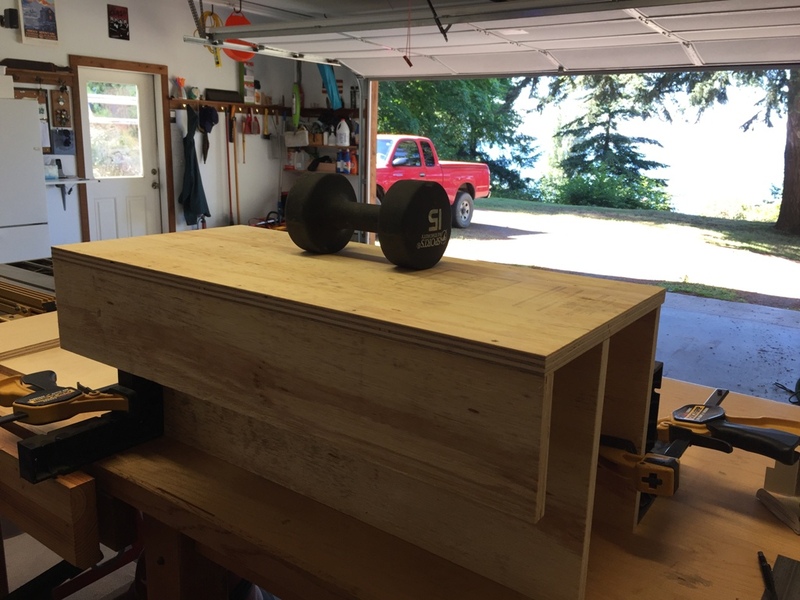 I figured the best way to do that was to built some boxes on top of it. 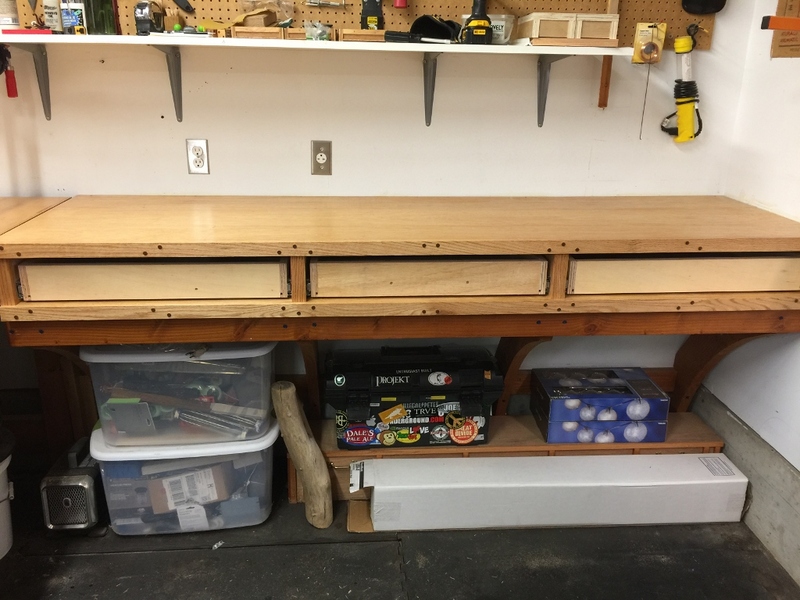 And then I can make drawers! So yeah, double plywood sheets for added strength, well bolted into the wall and reinforced by those brackets. 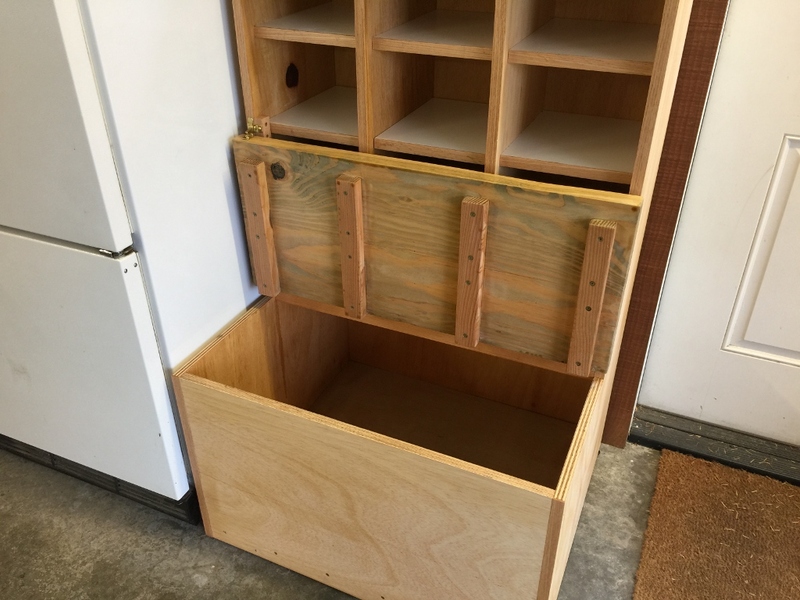 The drawers should be a nice size. 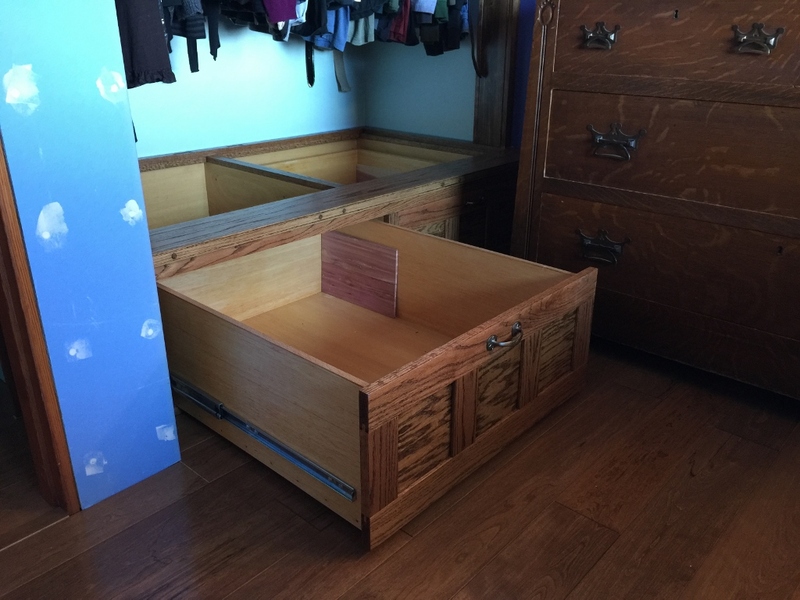 The drawers fit great. I’ll put some oak drawer fronts on them at some point. I partitioned one of the drawers, and now I’m wishing I did it to all of them. It was a pain, but having little boxes to organize things is really nice. Big cabinets. They’re going to go where that awful brown pegboard is now. 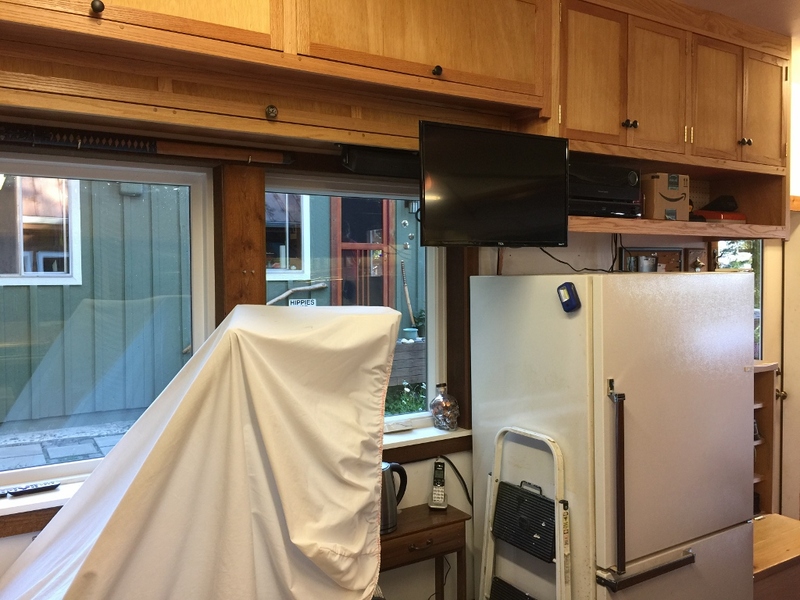 There will be under-cabinet lighting and doors that close and all sorts of fun stuff. 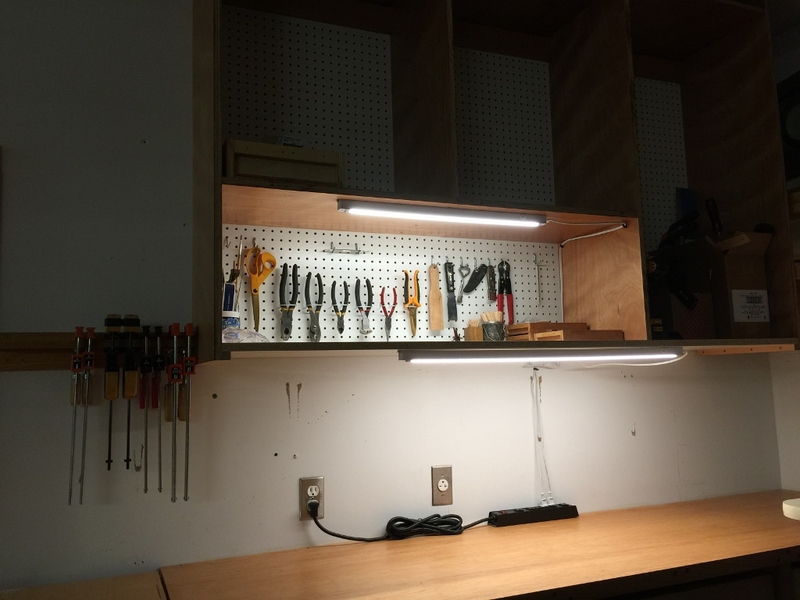 I like using pegboard for cabinet backs, especially for utility cabinets, as you can hang crap on that back wall if you need to. Maximize your space. 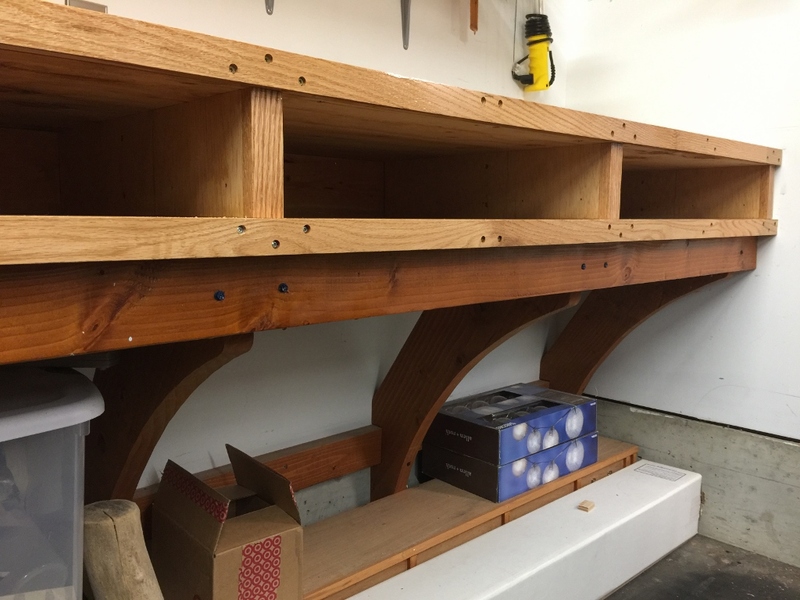 Posted in Shop, Tools, Woodworking	| Tagged That cabinet frame weighs like 200 pounds and I have no idea how I'm going to put it on the wall. This has been a cluttered corner for a long time. Things go here when they have no place else to go. 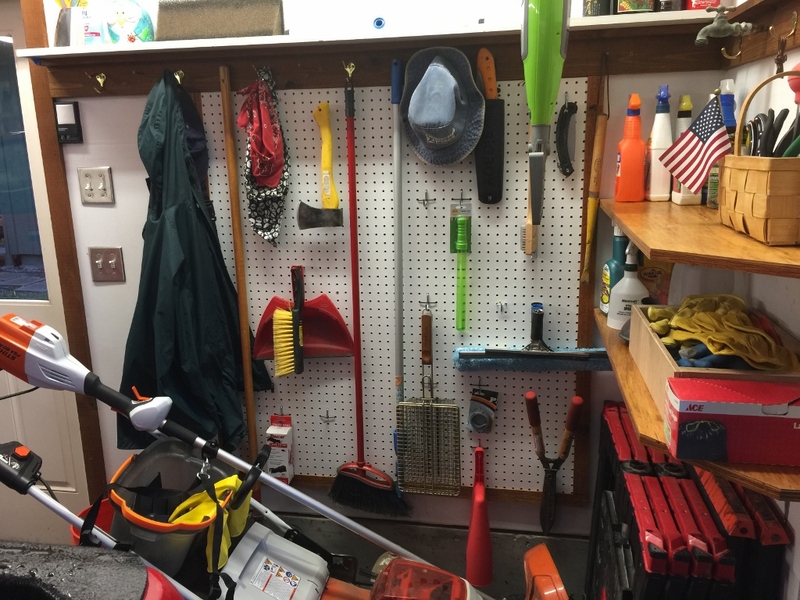 Gardening tools, bags of mortar, sawhorses, bicycle pumps, camping chairs, floor steam cleaners. 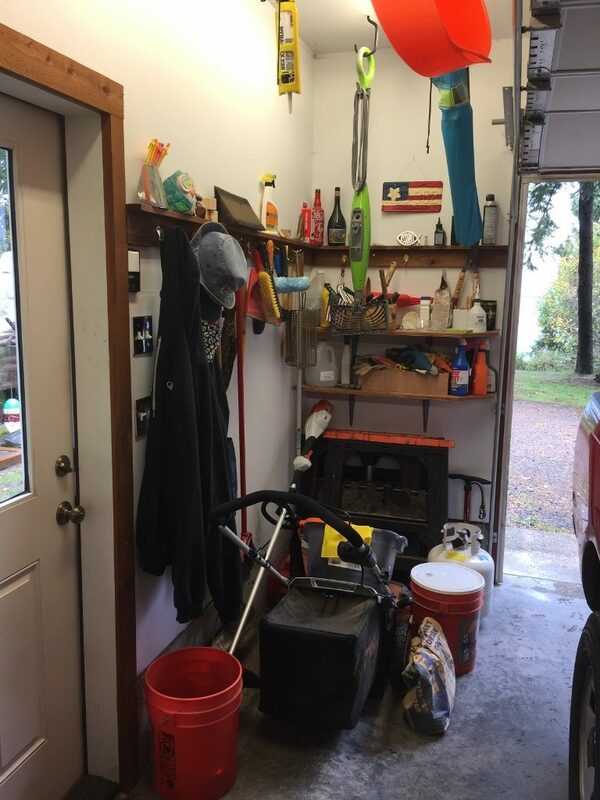 Hey, it’s what a garage is for, right? 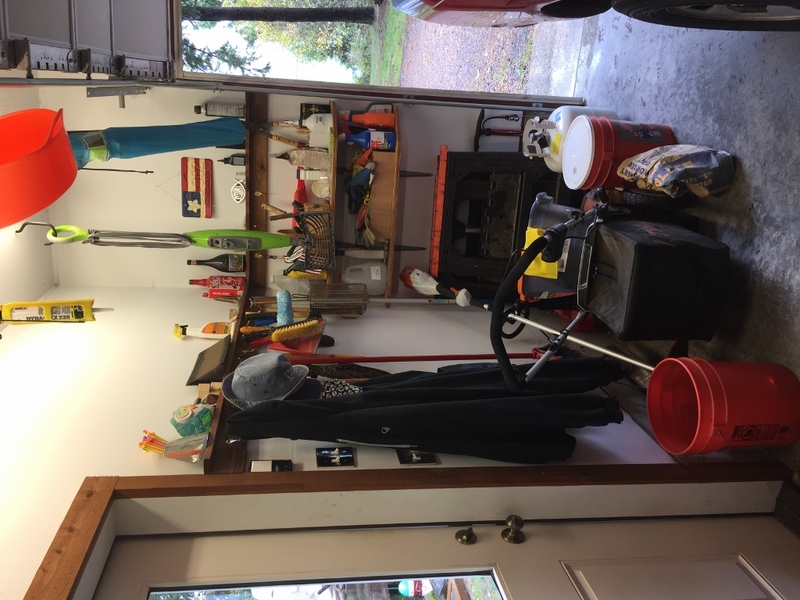 Well, this winter I’m going to be spending a lot of time introducing better storage solutions, cabinetry, drawers, better layout, doing all sorts of things to make the garage work better for us. 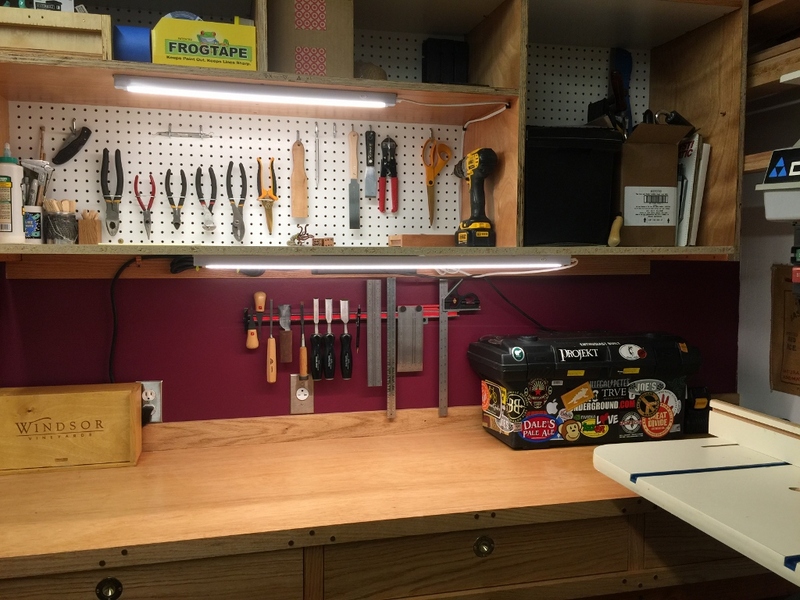 In this corner, I’m going to put up some pegboard to help hold the little stuff and keep it easy to access and out of the way. Yeah, okay, it’s still totally cluttered. But it’s an organized clutter! A big part of any organization effort is just getting rid of the crap you don’t use anymore. That always helps. Okay, this is a problem that we’ve been tripping over for years. This little corner by the rusty fridge has stored our shoes, but I’ve always thought this was a wasted space. So much more can be done with this area. Yeah, now we’re talking. 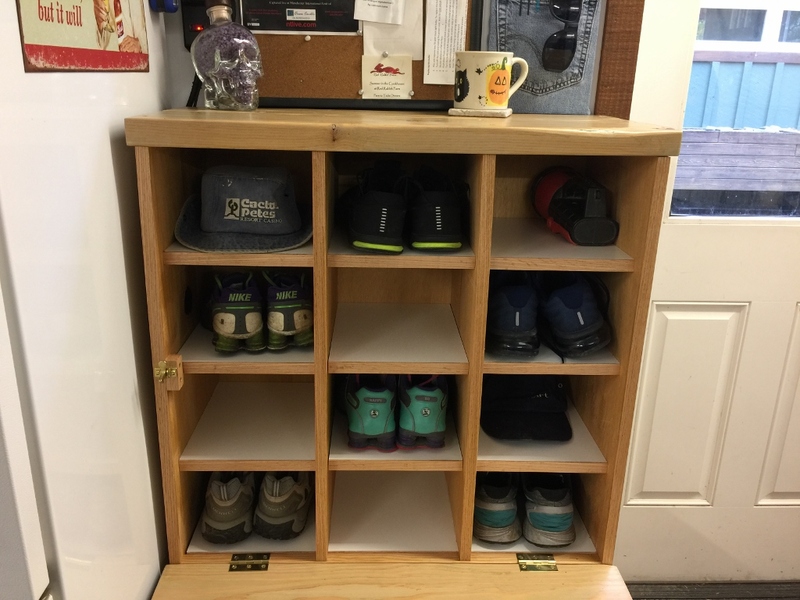 A little plywood, some lumber, a few pieces of hardware, and suddenly we have a space to store a dozen pairs of shoes, with a place to sit to put shoes on, and a storage trunk to store whatever you want! 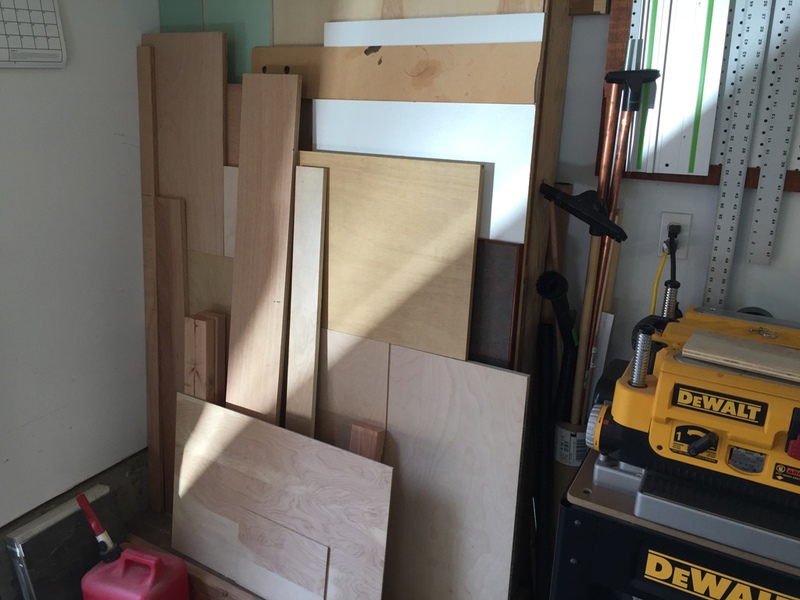 I’m not fond of plywood for making furniture, but this is my garage, not the Earl Gray Tea Room in Buckingham Palace. Function beats out aesthetics. All it has to do is work. 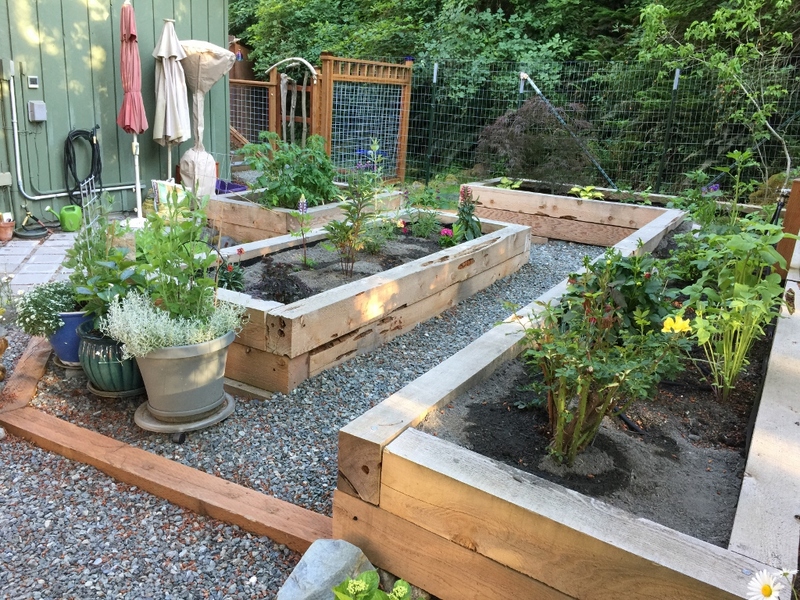 I bought 2×8 lumber for the top and the bench, and I dug up the most beaten, moldy and weathered pieces I could find out of the wood pile. 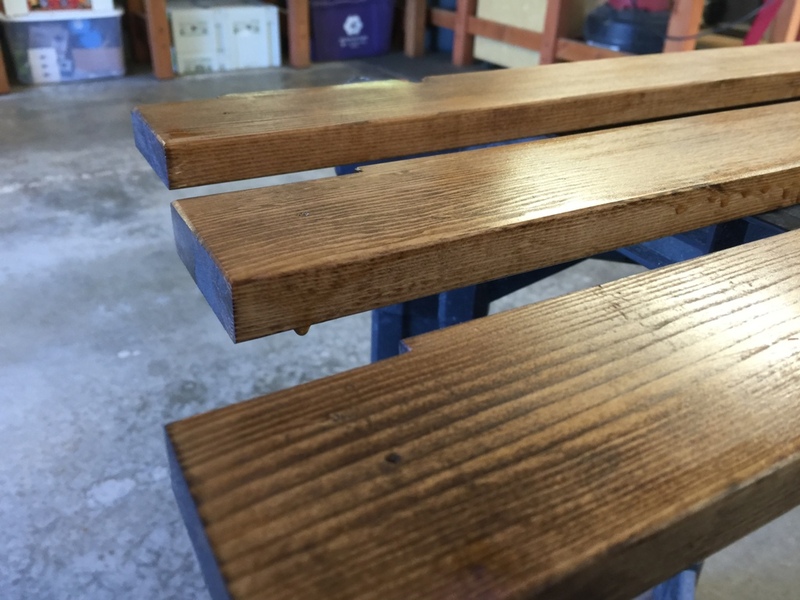 Old wood like that can polish up pretty good. I like the color, and it’s sturdy as hell. I went cheap for hardware, but made sure to use solid brass. 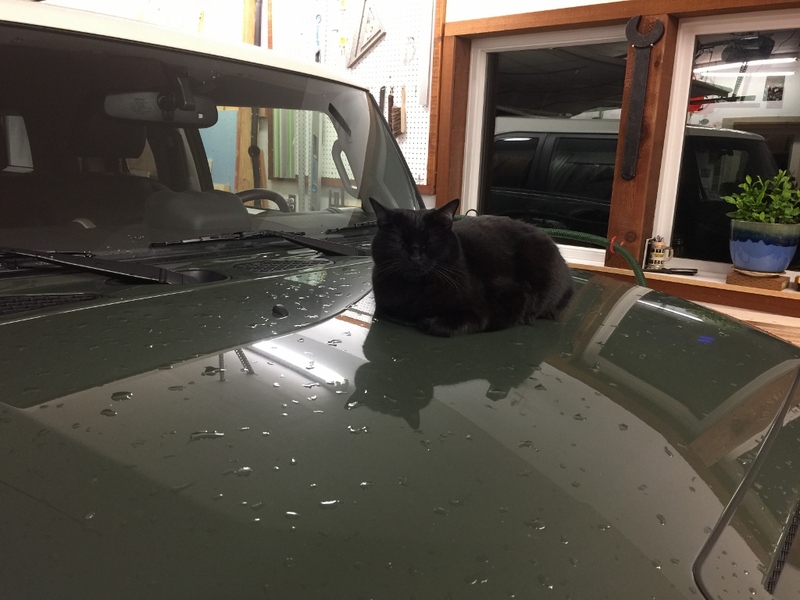 It can get a little humid out in the garage. I’ve had this little clasp for ages, finally found a use for it. I think it probably wanted to go in a window or something, but here it works great, holding up the lid to the trunk so it doesn’t break your arm. That’s like 10 cubic feet of storage in there! Happy shoes. They all have a home and there’s room to grow. It’s been a trying few weeks. 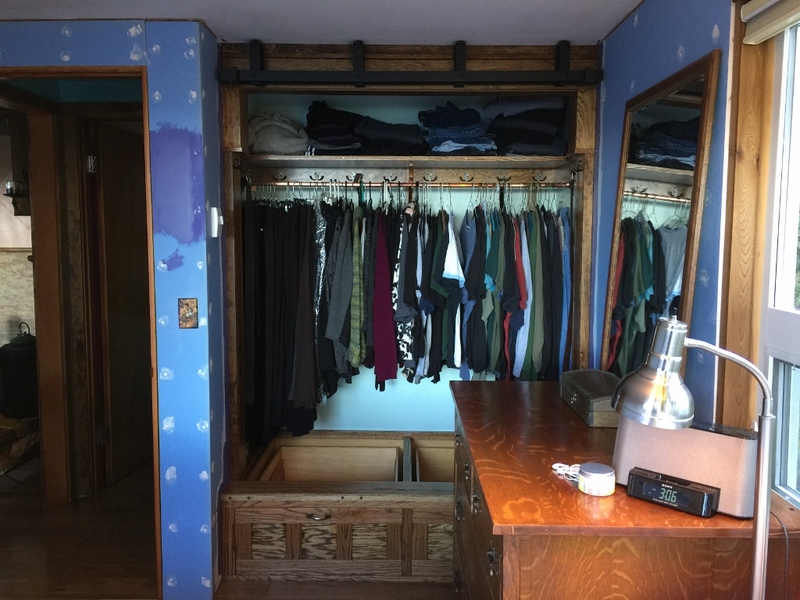 All our clothes and shoes have been scattered to the four corners of the house while I’ve been working on the closet. Our hanging clothes hung from one of the beams in the living room, blocking the television from my favorite chair. Shoes and boots have been on a towel next to the tv. 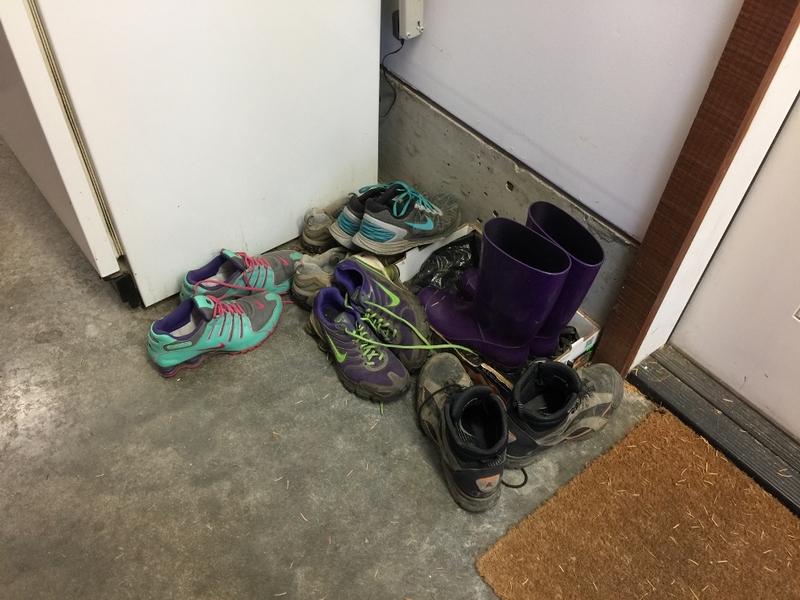 Other shoes and boots are in a box out in the garage. Sweats and sweaters are on a high shelf in the laundry room. My jeans are on the bookshelf behind me. It’s the War Zone. We’re used to it by now, and we know the drill. It doesn’t last forever, and when things go back where they belong, it’s refreshing to see the house all nice and clean. It’s like the day you put all the christmas decorations away. They’re nice to have out for a while, but eventually, you want your house back. 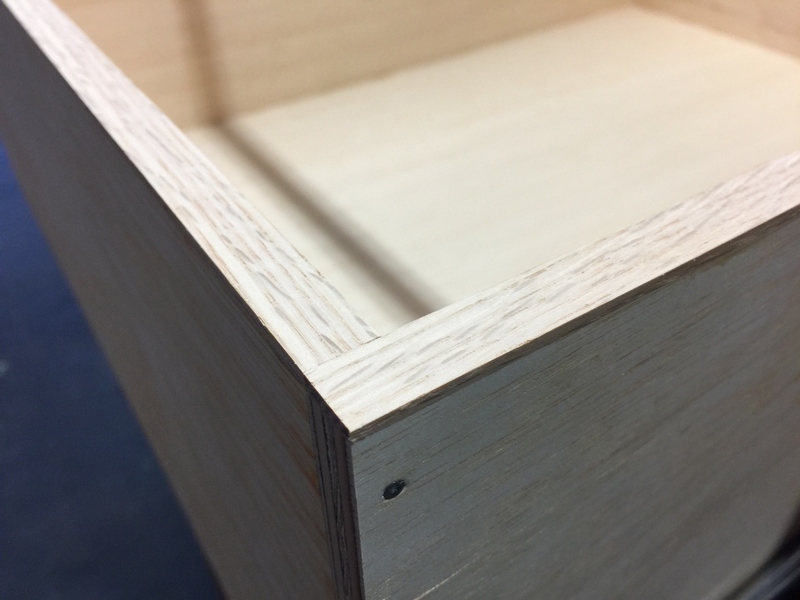 The drawer fronts came out great. Cannot complain. 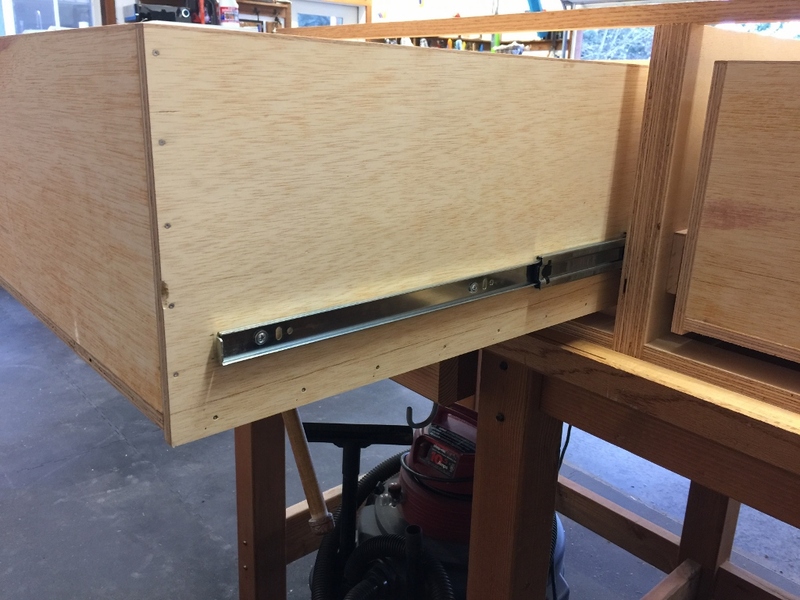 I just did simple tongue and groove with panels, which got glued and screwed to the drawer box. They should last the life of the house, or longer. 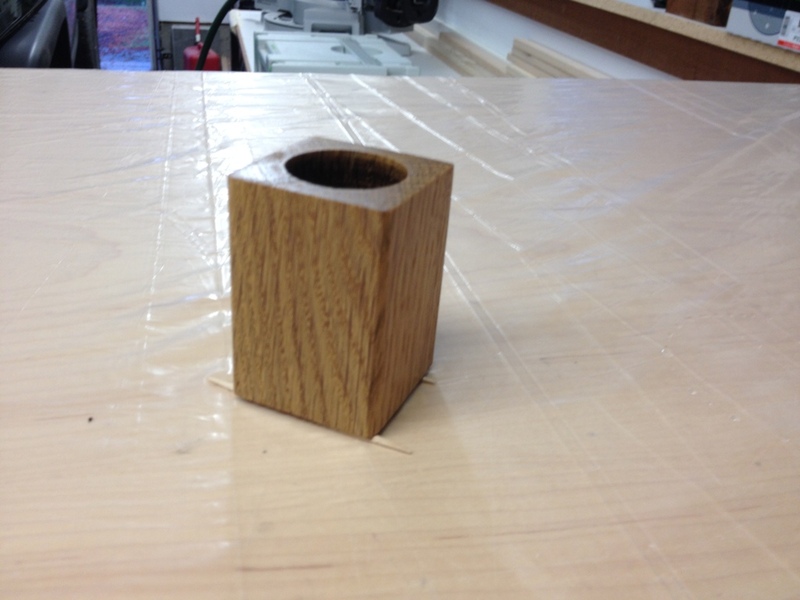 It’s really nice to be working with oak again. Hardwoods are hard to come by out here, and expensive. 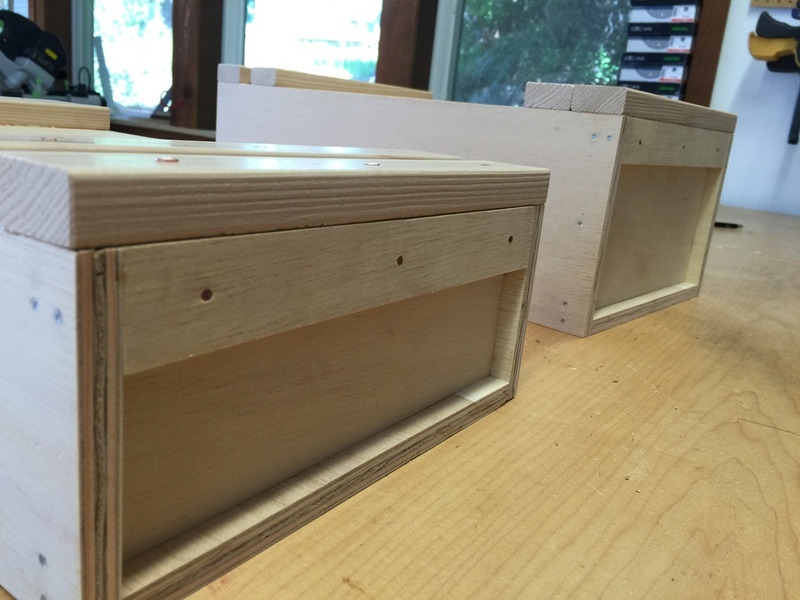 These are the frames that go on the built in boxes already in the closet. 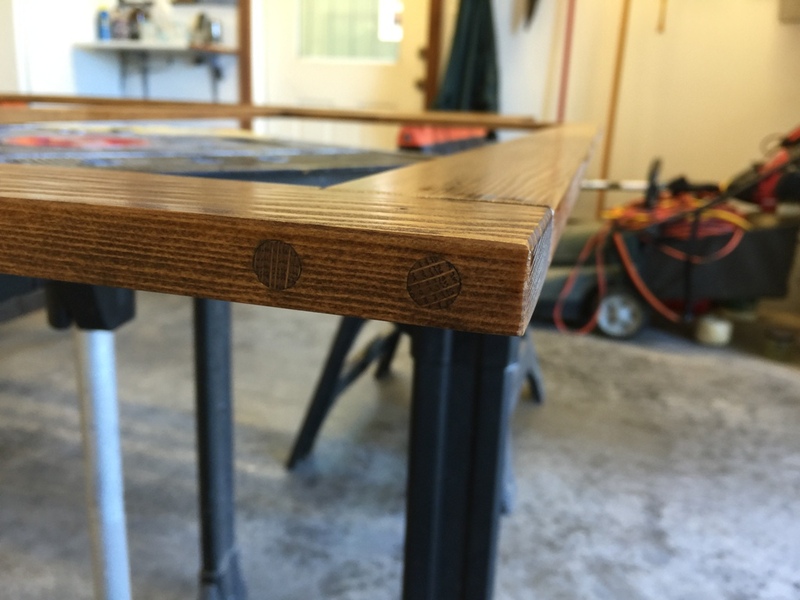 I rarely do mitered joints (because I’m not very good at them) but the corners on this one came out pretty good. I cheated. 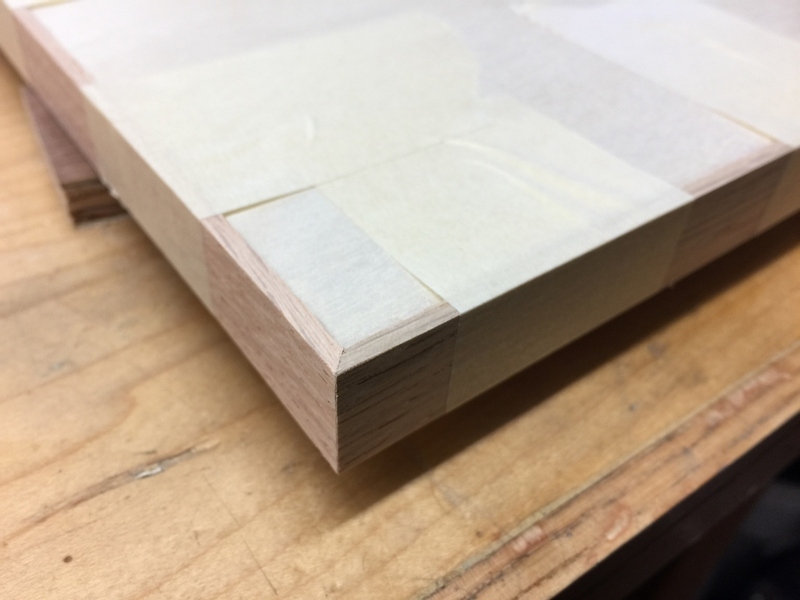 Before I cut the strips, I cut one end of the board to 45 degrees, so that I had at least one perfectly clean miter without any tear-out or burn marks. Everything installed pretty smoothly. A lot of math went into all that, and I guess I did it right this time because I didn’t have a whole lot of problems. 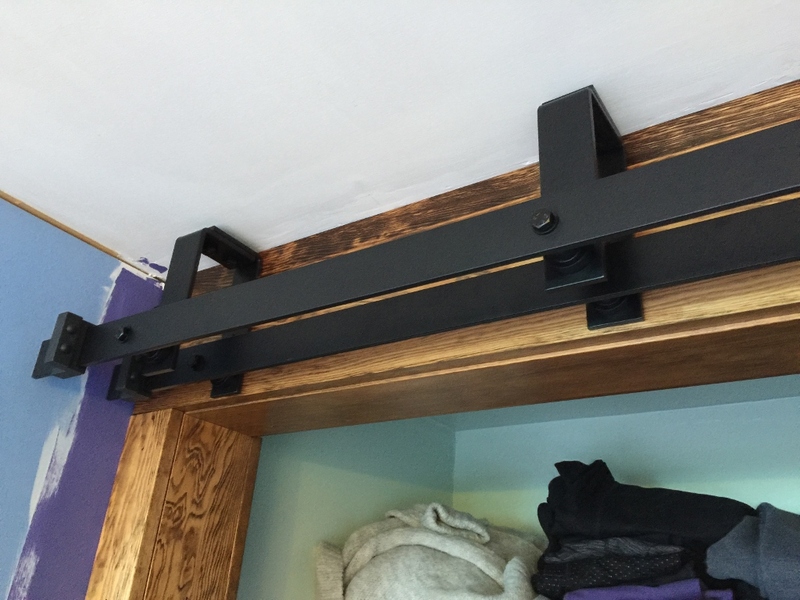 For closet doors, we got these hugely big rails for barn doors. This thing is very heavy and I had to put in a new header to support it. The header is bolted in place with these gigantic lag bolts and then reinforced with some additional framing. I think these are going to be the strongest doors in the house. The hardware instructions were ridiculous enough, but I ended up modifying the install anyway so they were completely worthless to me. 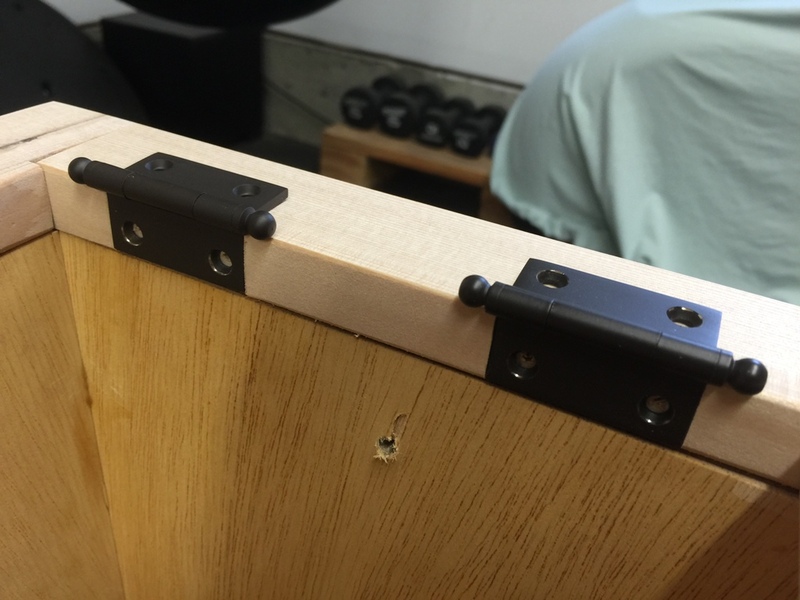 I ended up drilling holes in the brackets to accommodate another lag bolt to make sure it was secure enough. This steel was tougher than the cheap packaging would have you think it is. A hint: when drilling through thick metal use a little machine oil on your drill bit. It makes a big difference. Nice! I don’t even need doors, I’ll be happy just looking at my open closet. 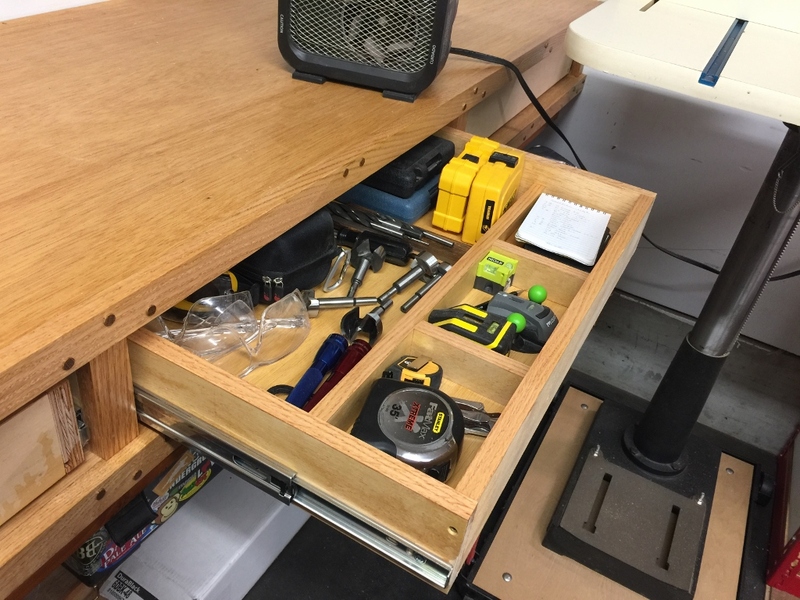 The drawers work great, very smooth operation. 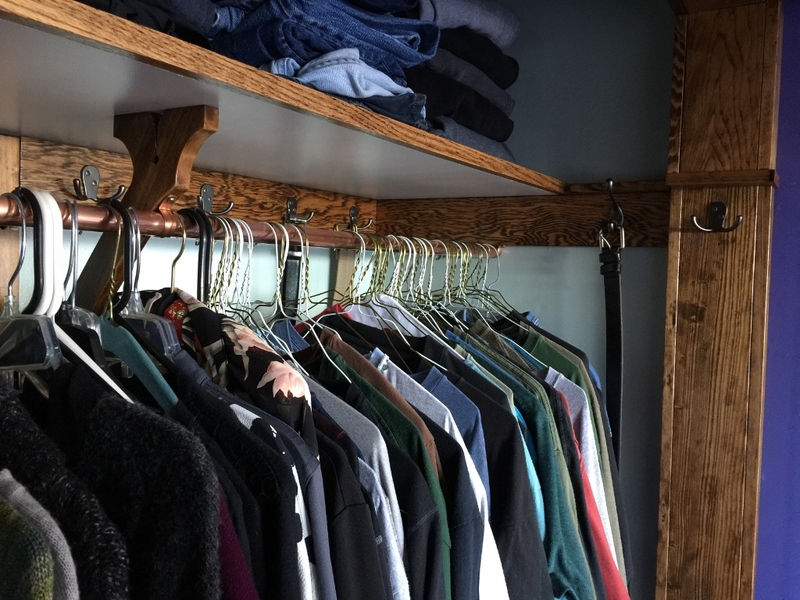 Using a polished copper hanging rod really helps the clothes slide a little bit. The old rod was badly worn. Kind of looked like driftwood found on the beach. 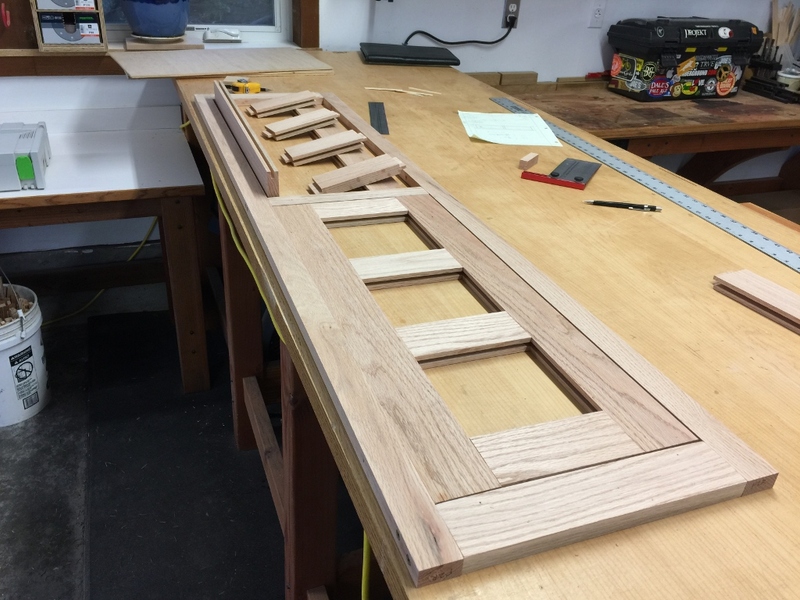 Here’s the rails for the bypass barn doors. The house isn’t level but these needed to be, so they do look a little crooked if you stare at them long enough. 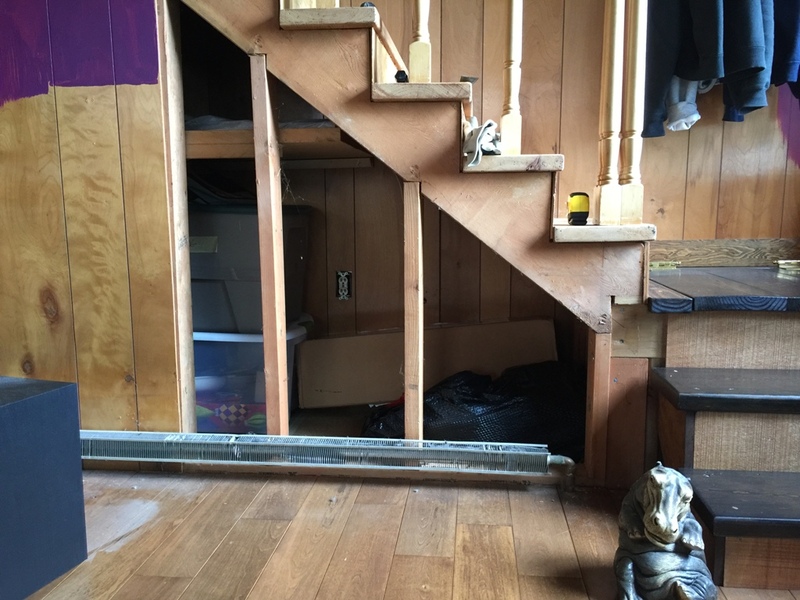 But the last thing I needed were sliding closet doors that rolled out of place when you weren’t looking. I do love the built-in drawers. Such a huge difference over the last ones. 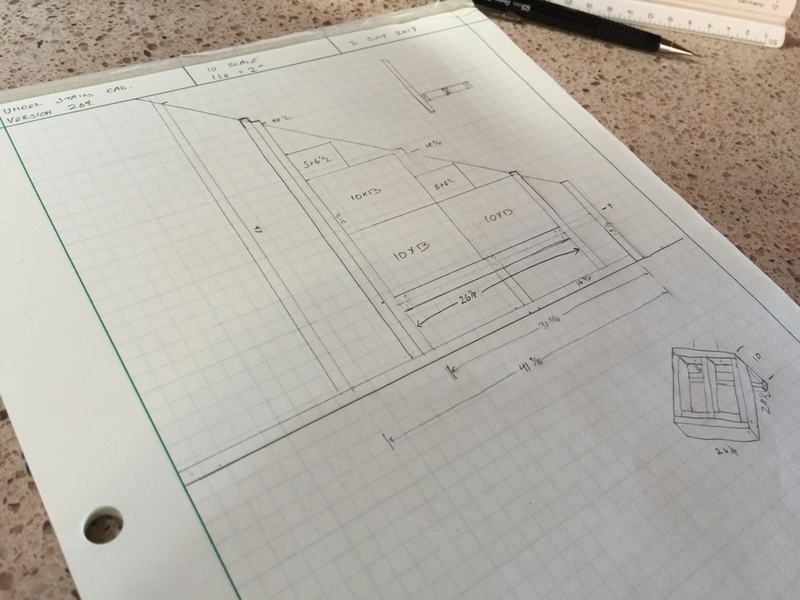 Next up, I’ll make the Bam Doors … er, the Barn Doors for the closet. I need to remember to take some pics of the existing drawers when I smash them to pieces while cackling like a maniac do the demolition work. I just want the world to see how special they are. Well, the internet. Okay, the ten or twenty people who visit this blog. 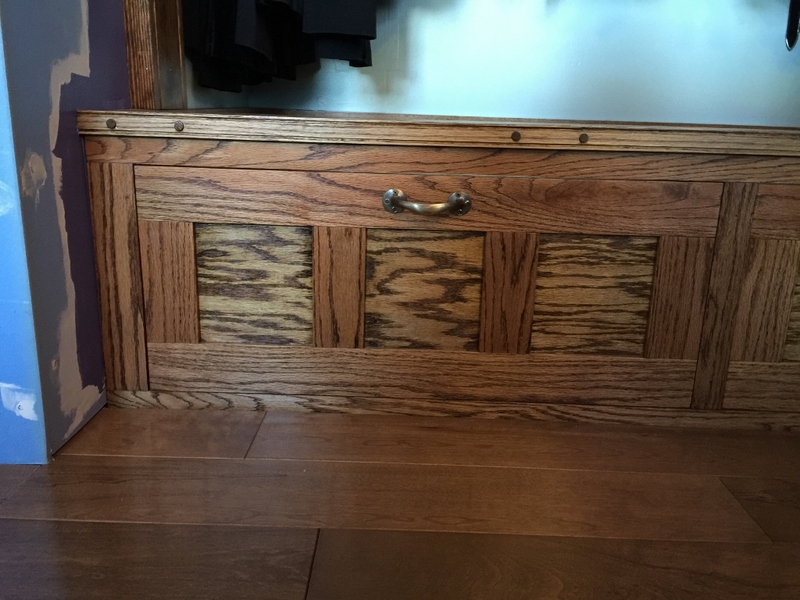 The existing drawers are just hideous. Maybe that’s why I’m putting so much time and care into the drawers that will replace them. 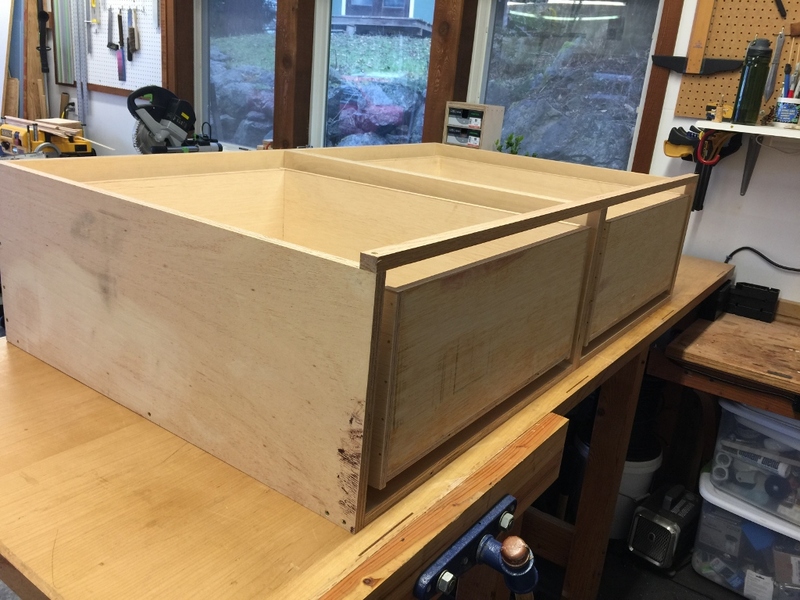 The new drawers are coming along wonderfully. I’ve only screwed up like four or five things so far, all easily fixed, so I’m going pretty good by my standards. I didn’t have much time this weekend, though, as I was up on the hill behind my house clearing brush with a machete. This is no-man’s-land. 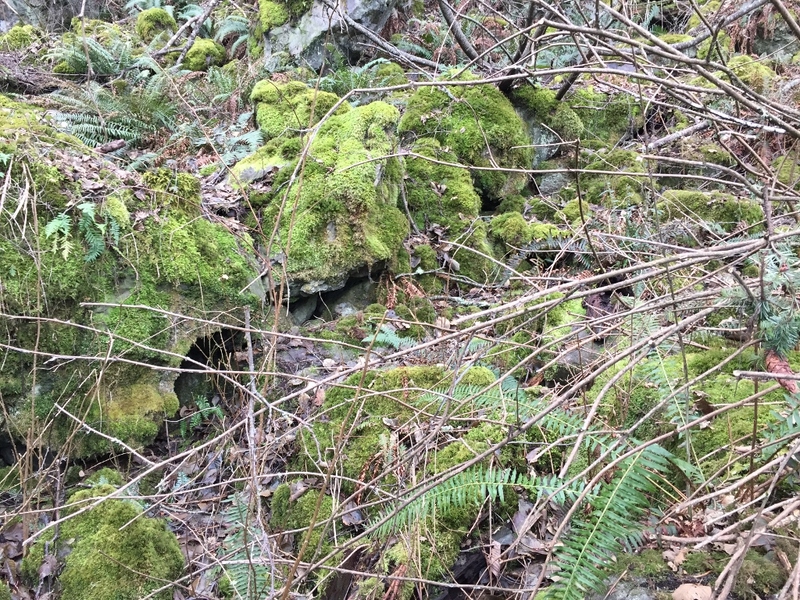 We get these vine-like bushes that sprawl like weeds, and overtake everything on the hillside. They’ve already devoured a spruce tree near the driveway. I needed to clear a bunch of them that were threatening the shed behind the house, and ideally on a warm, dry day before spring. Once spring comes along, they’re heavy with new growth, full of bees, swarming with wasps, and covered with new, sharp thorns. Got my opportunity on Saturday, a nice dry day here, so I was up hacking way at them. 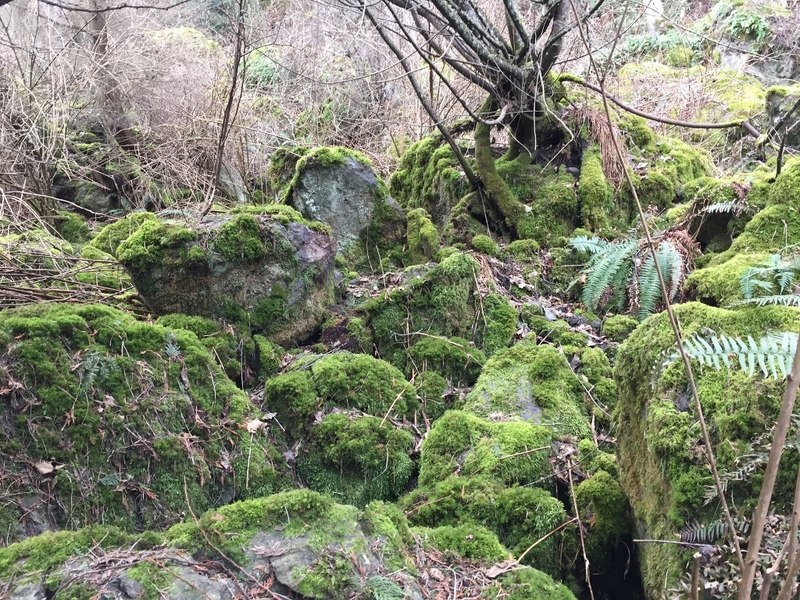 It’s rocky, it’s overgrown, there is no good footing, and thorny plants and vines are everywhere. But it’s remarkable how peaceful it all is. One of these days I need to forge some kind of a trail or a path up there. Maybe make a hidden Buddha shrine or two. So after a few hours of grueling labor it was back to the shop. 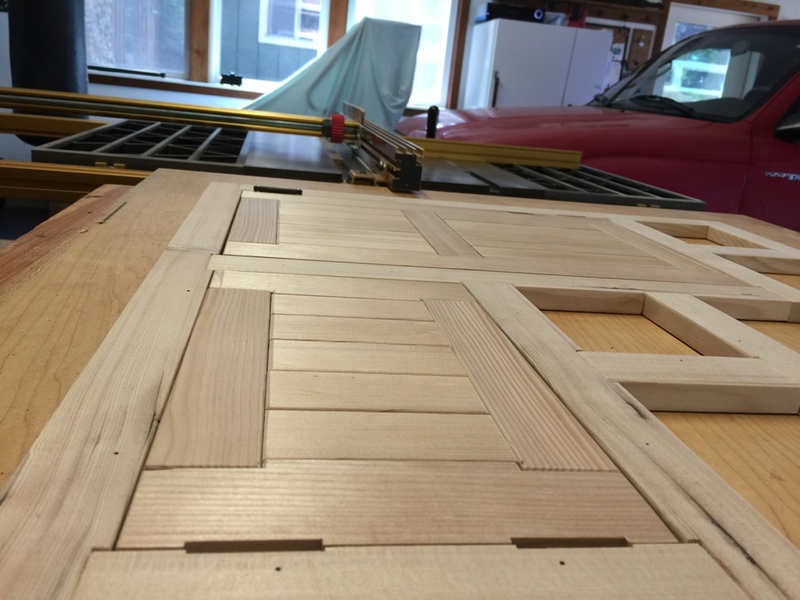 I decided to cover the end grain of the plywood with oak strips. 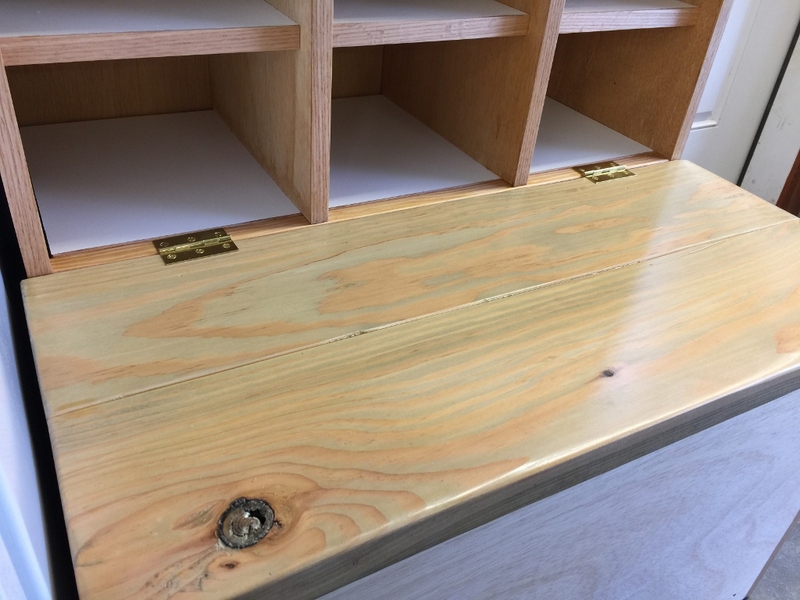 I wasn’t going to do it initially, it’s kind of a pain and takes a bit of time and care to do correctly, and all the other drawers in this house have exposed plywood end grain. But I wanted these to look nice. 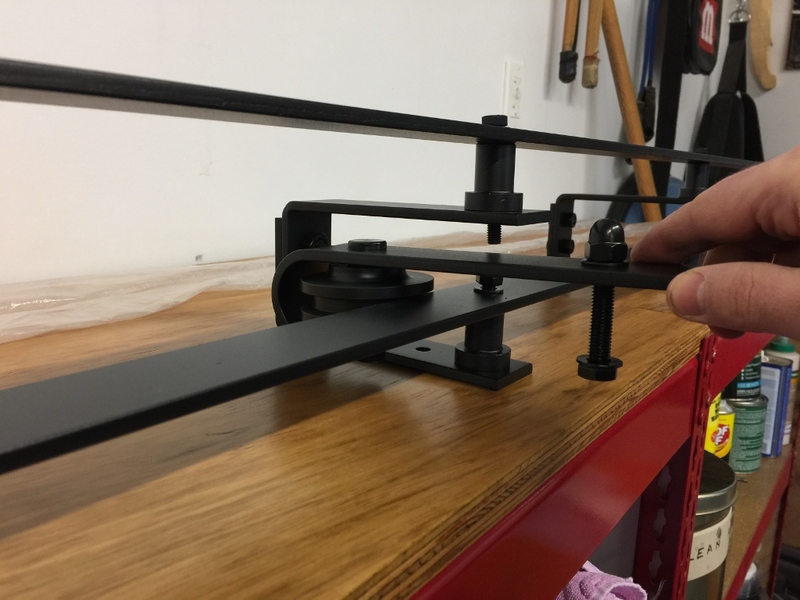 The drawer glides are these big beefy 24″ steel contraptions that are several orders of magnitude stronger than the drawers themselves. 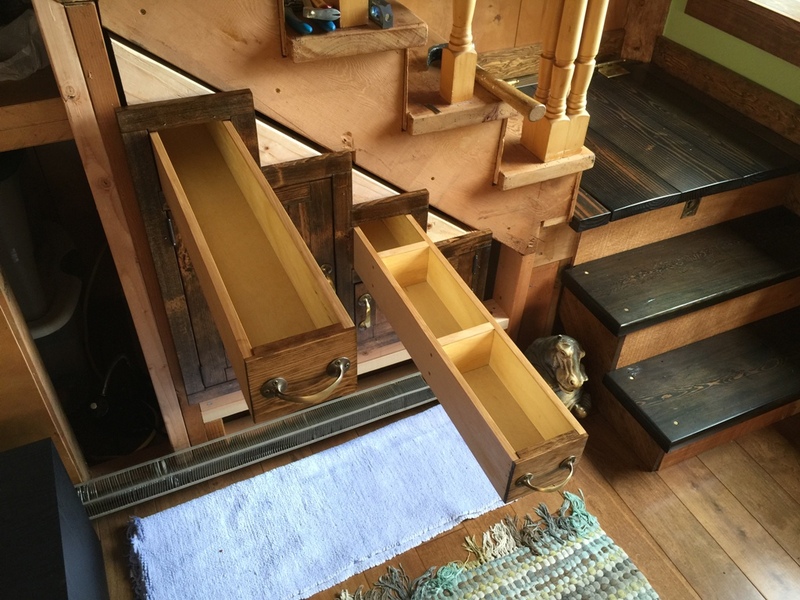 They’re a little finicky to install but when it’s all done the drawers open and shut beautifully. Looking pretty is nice, but at the end of the day, they just need to open and shut. 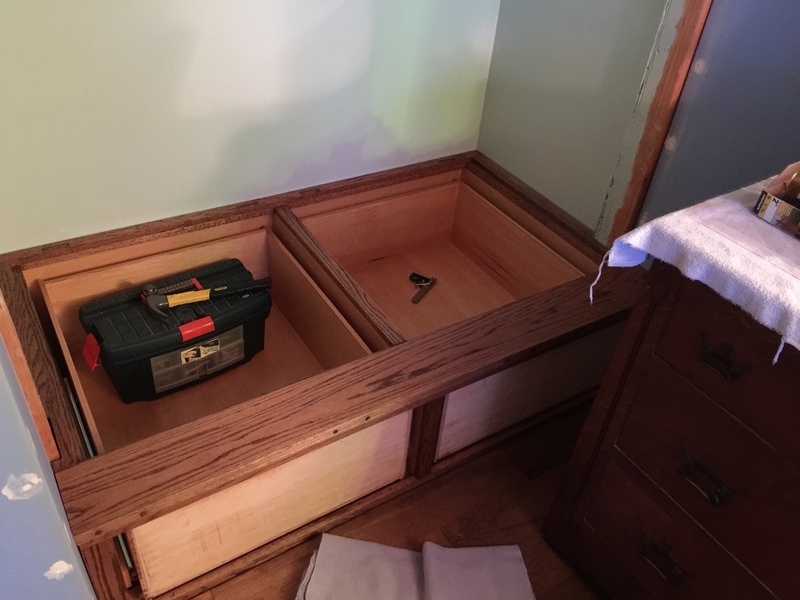 Drawer fronts and framing will all be out of red oak. I need to install this base first, though, before I can make the exact measurements of where everything is supposed to be. It’ll be fun getting this into the closet. All that hard work this weekend. I need to go down to the beach again soon! 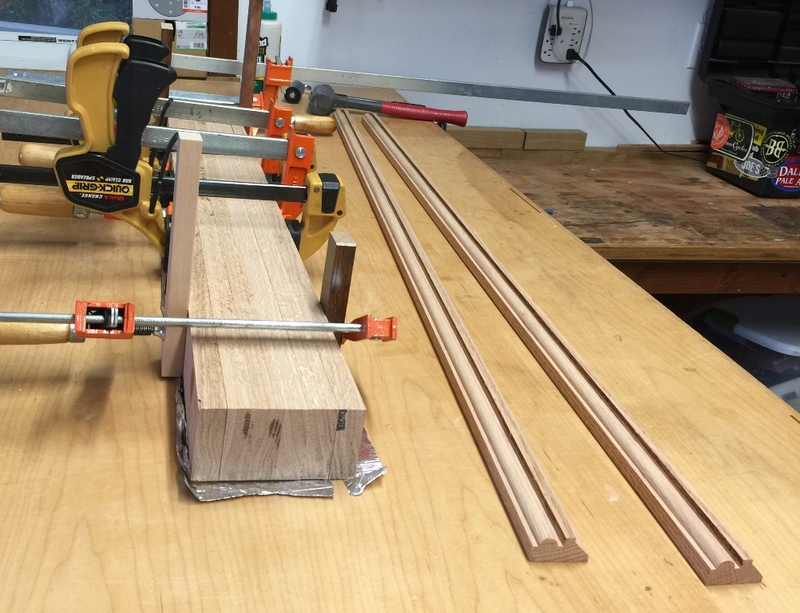 The only stock I had available was all milled to 3/4, so I had to join a bunch together to make that middle part. See, I don’t even know what post parts are called. Whatever that middle part is called, that’s what I made. 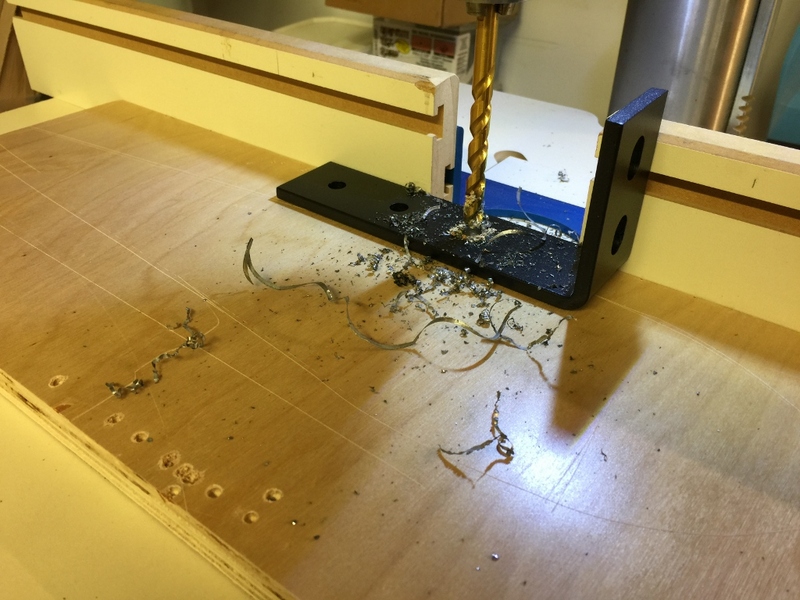 Oh, and I made some strips on the router, and they’ll go around the, um, the other post parts. Whatever they’re called. 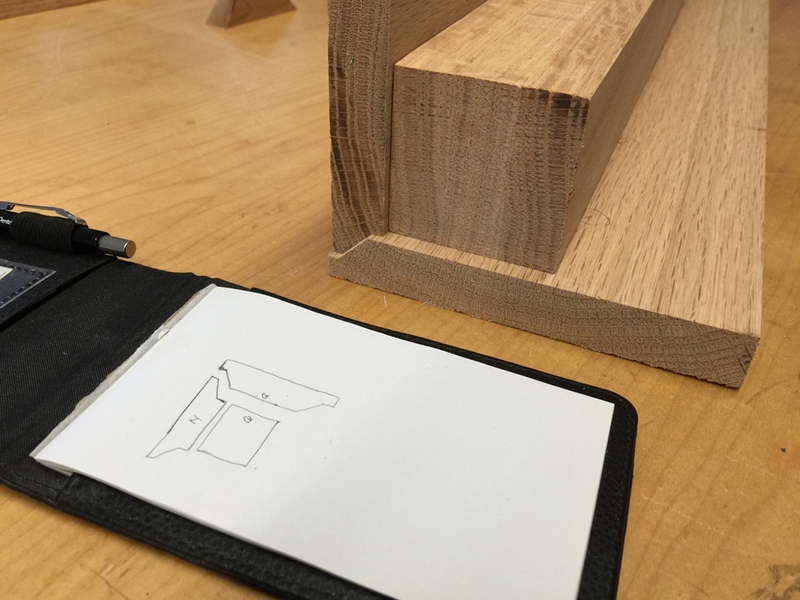 Laying out the joinery took some very careful planning. 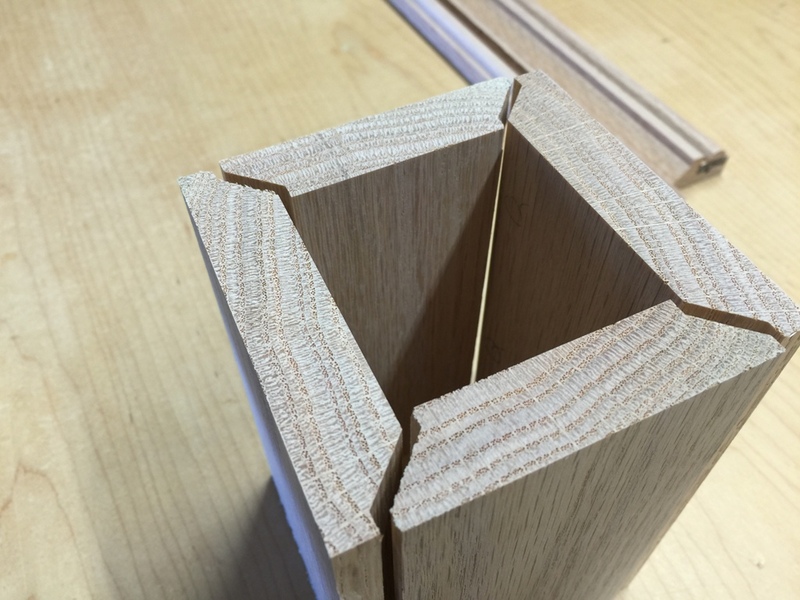 This kind of joint is a lot stronger than just doing a simple mitered joint, and it fits together very squarely. In fact, it’s hard to make it not square. 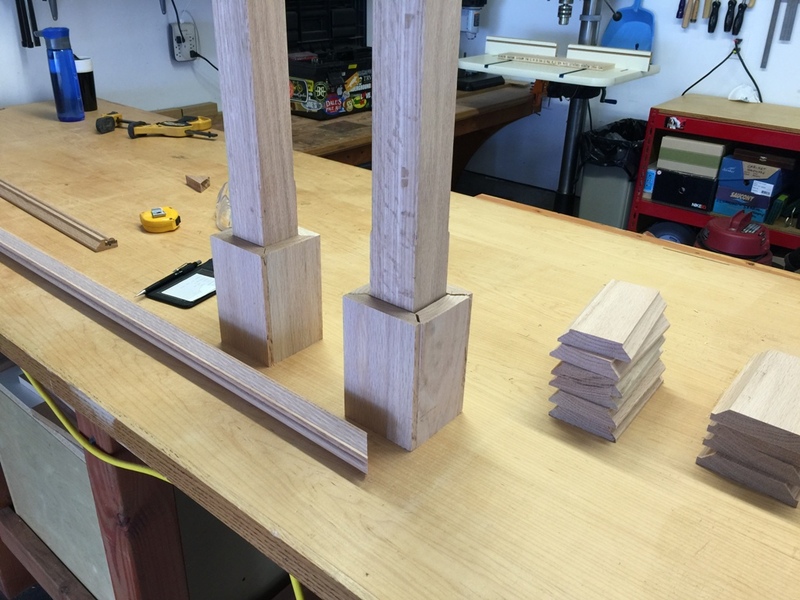 These will be for those things at the top and the bottom of the post. Everything’s going together very nicely. 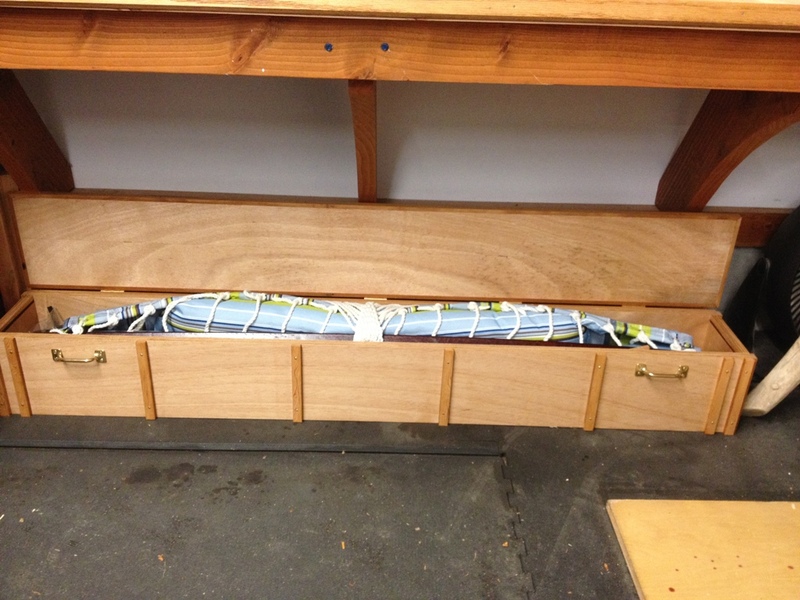 Just because there were a lot of pieces being glued, I used tape to hold them all together, then clamped them. And then I remembered what happened the last time I left clamps on tape overnight (the glue from the tape pressed into the wood and made areas that didn’t take stain very well) so I had to remove all the clamps and take off the tape and put the clamps back on. Live and learn, and forget, and re-learn. It’s a clamp bonanza! Not to mention a tripping hazard. The top part thing (maybe it’s called the cap?) was a little more difficult than I wanted it to be. Took a few tries to get it correct. 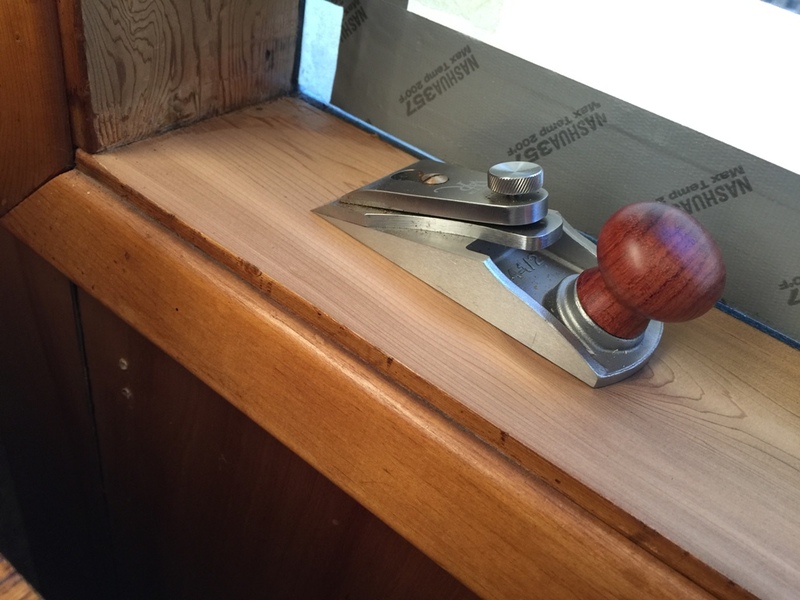 Plus, that wood’s just a bit too big for the saw, and there were cuts where the saw couldn’t cut all the way through. The end result looks good, though. In the end it all came together. These are going on my stairs and they’ll support the handrail at the top and bottom. 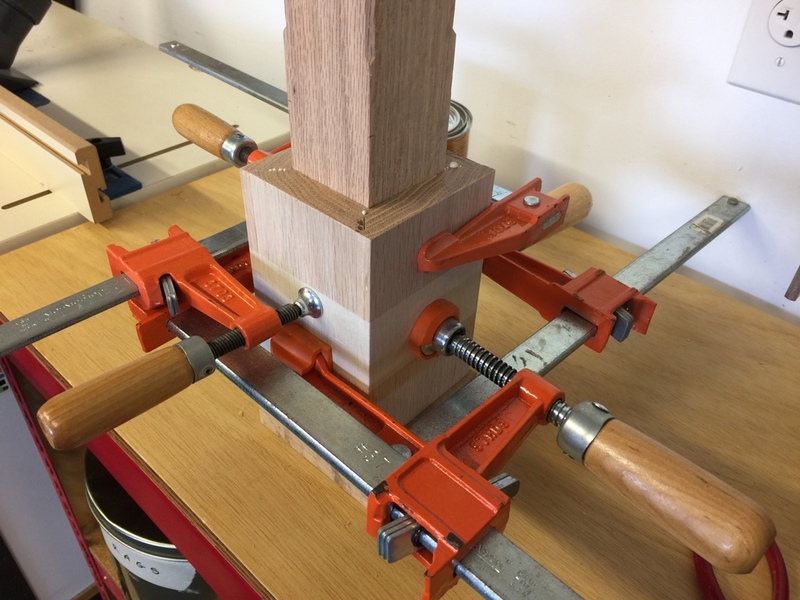 There’s one block I didn’t glue on, and that’s so I could bolt it into place and affix it with a couple of pocket screws. 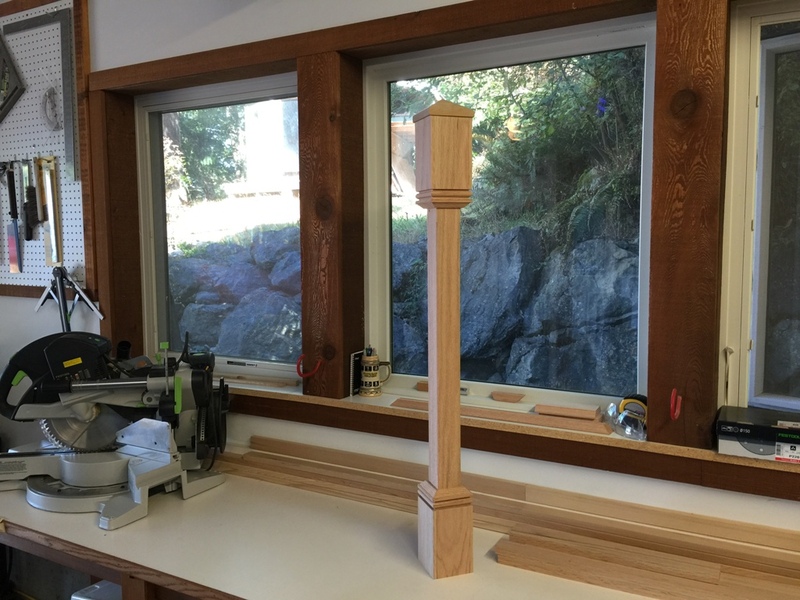 I’ve done this a couple times before on other projects, and it can get a little tricky to get them standing perfectly straight and tightly fitted to the floor. I’ll have to be ready for anything. 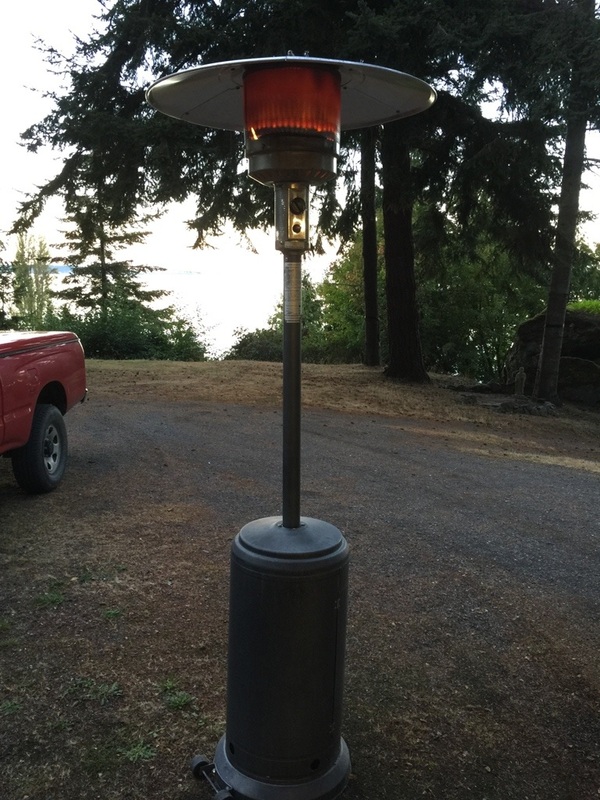 Here’s our newest toy, something to keep us toasty warm when it gets cold out. A pity I can’t use it in my shop, it would be lovely to have that kind of heat in there, but it’s an outdoor toy. Posted in Renovation, Shop, Tools, Woodworking	| Tagged I googled for post parts but all I got was information about a form of depression that occurs after giving birth. You know that space in the way back of the closet that you can’t ever get to? We have a space like that, and it’s really inconvenient. It’s near the base of the stairs so the only way to get there is to crouch and crawl, and remove the boxes and baskets and whatever else got put in the way. It was to the point that if I knew something was stored way back under there, I’d rather go buy a new one than crawl in there and retrieve it. 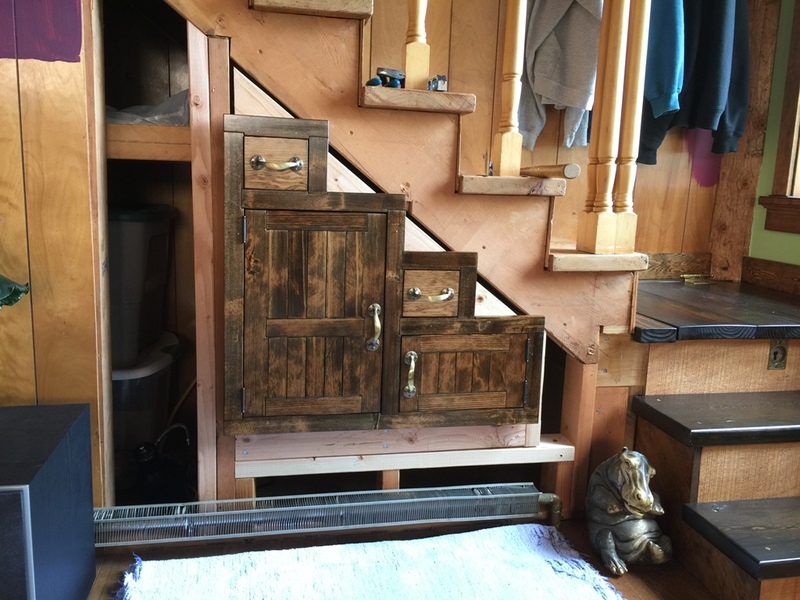 I thought this would be a great place for some built-in cabinetry. The logistics of this was actually a little tougher than I thought. 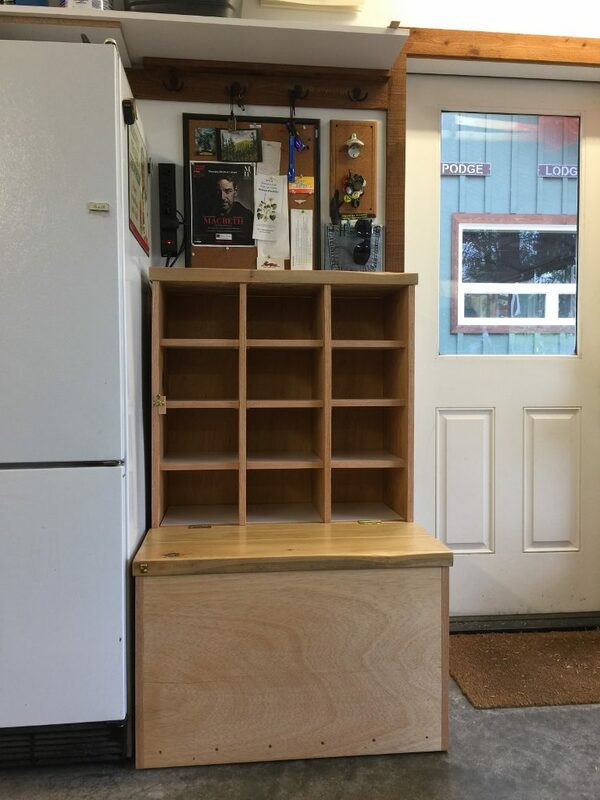 The little heating thing down there meant I couldn’t make these cabinets all the way to the floor, they’d need about a foot of clearance, so that right there eliminated 12 cubic feet of storage space that I’ll never get back. But still I was determined to make this thing work. The final cut list would consume exactly one sheet of plywood, which I took to be a sign that this was meant to be. But once it started coming together full scale, it made me realize there were still problems to overcome. 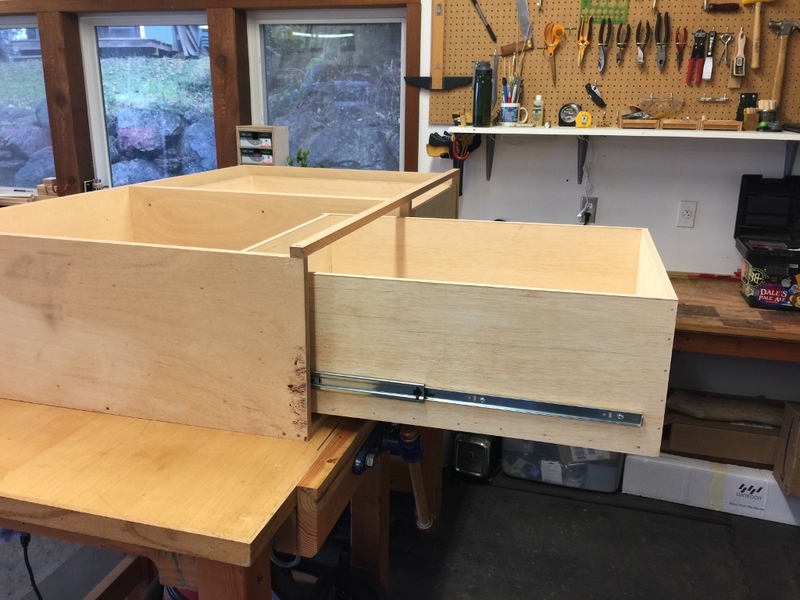 Those small boxes seemed a lot bigger in my head, but now it was clear that I had to make these long, narrow drawers, or they’d be useless. Not to mention the problem of how to get polyurethane in there. I should have finished everything before I assembled it. I did find an unused electrical outlet in there, and it works and tested out okay, so I decided to move it to the front of the cabinet. Make it a little more useful. Please consider that it was 100% useless before, so anything would be more useful. 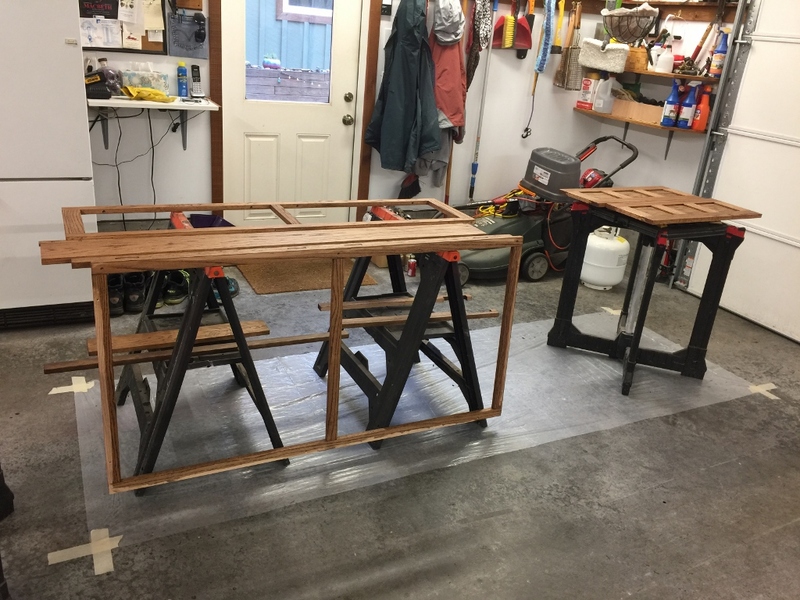 Once the carcass was assembled, it was time to make and fit the frame. Nothing fancy, just a bit of hemlock I had lying around. 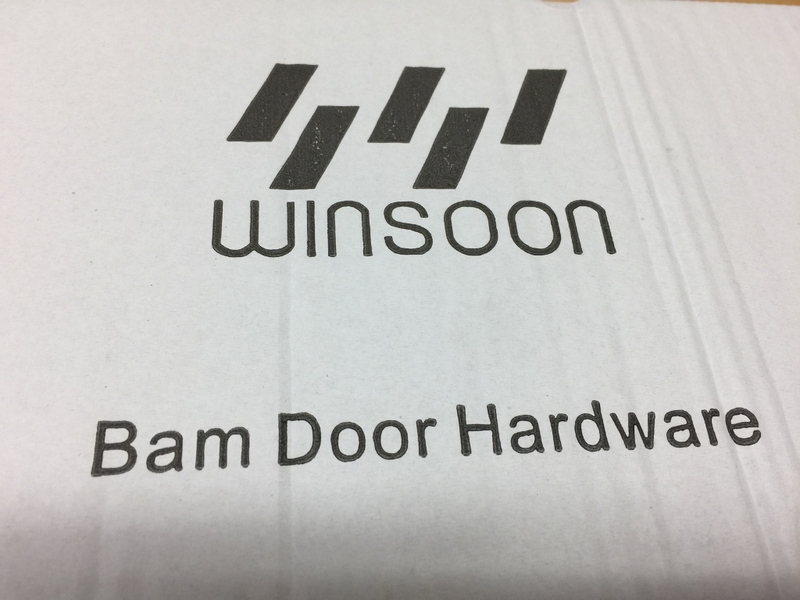 The doors came out looking really good. And they were flat this time too. And square. I’m getting better at making doors, I think. 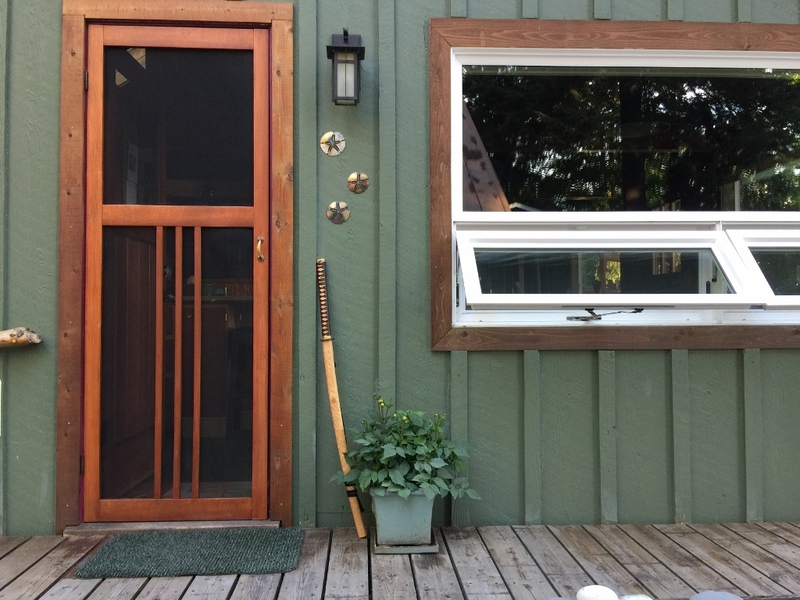 I think the hinges cost about as much as the plywood and the hemlock put together. I like good hinges, though. Makes the install go a lot smoother. And here it is stained and finished and hardware installed and fitted into its hole. Still some adjustments to make before final install, but I think I’ll wait until I have the rest of that paneling knocked out and I’m ready to drywall. I just pinned it in place so I don’t have to look at the hole in the wall anymore. Not sure if that storage is anything good except for ninja throwing stars and nunchucks but I could make that work. 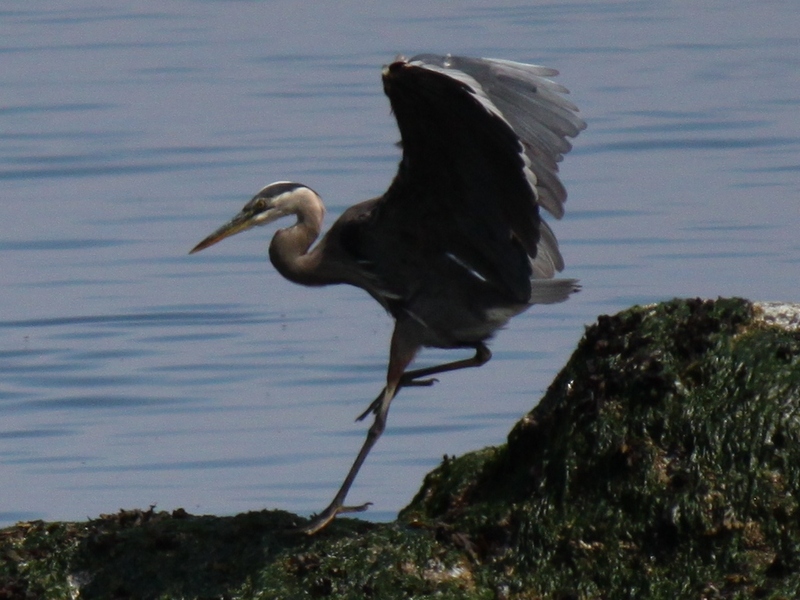 Saw this heron out fishing at low tide. If he seems a little annoyed at all the tourists, well, he is, I assure you. Everyone come running because I am giving shop tips today! What? No one. Okay, everyone come running because you’ll get two bucks! 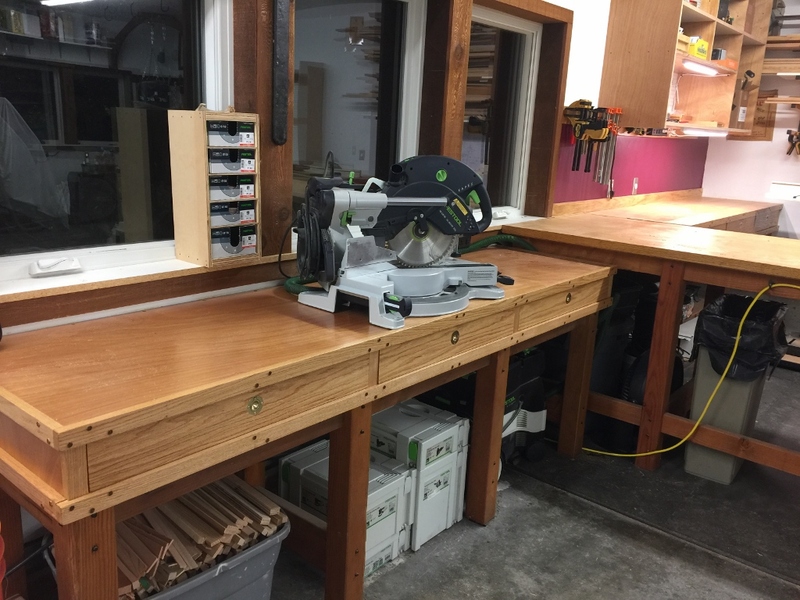 Maybe these shop tips are things you already knew, but there’s still value in reading them, because even if you know 90% of this stuff, it’s the 10% that you didn’t know that might make you a better woodworker. 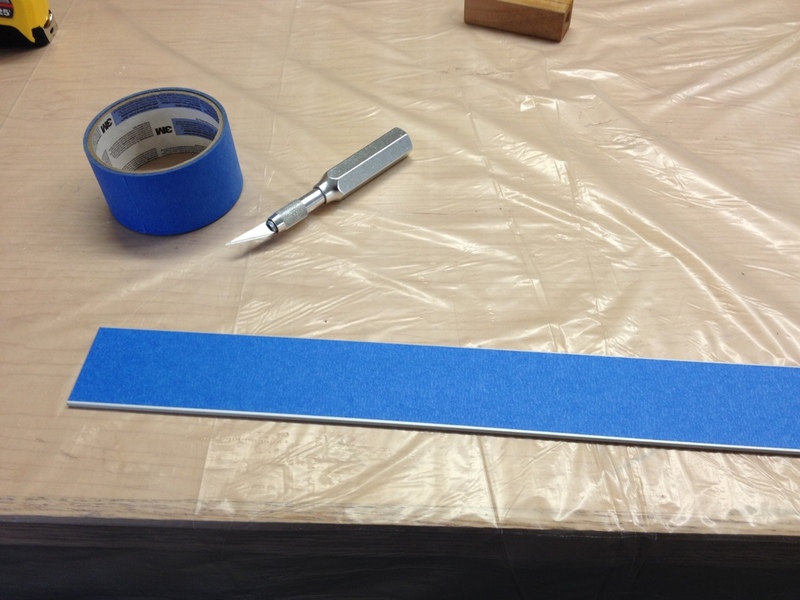 Those long aluminum rulers are great, but they will leave marks on things like drywall and painted surfaces. So cover the back of them with some masking tape. It makes for a smooth surface that won’t leave marks. Do not put tape on the front side, though, because then you won’t be able to read the numbers. 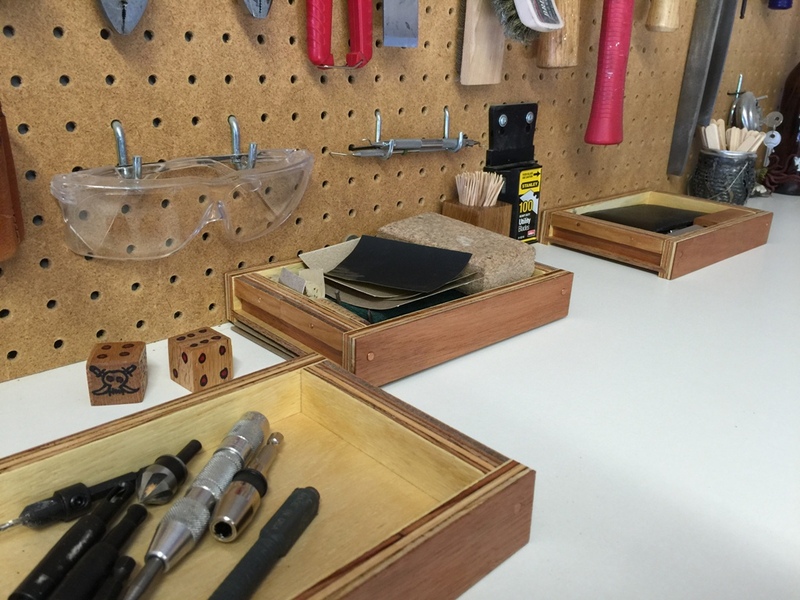 Sanding pads are expensive, so get the most out of them. Even when they’re spent, there’s usually enough grit left on them that you can sand some things by hand. 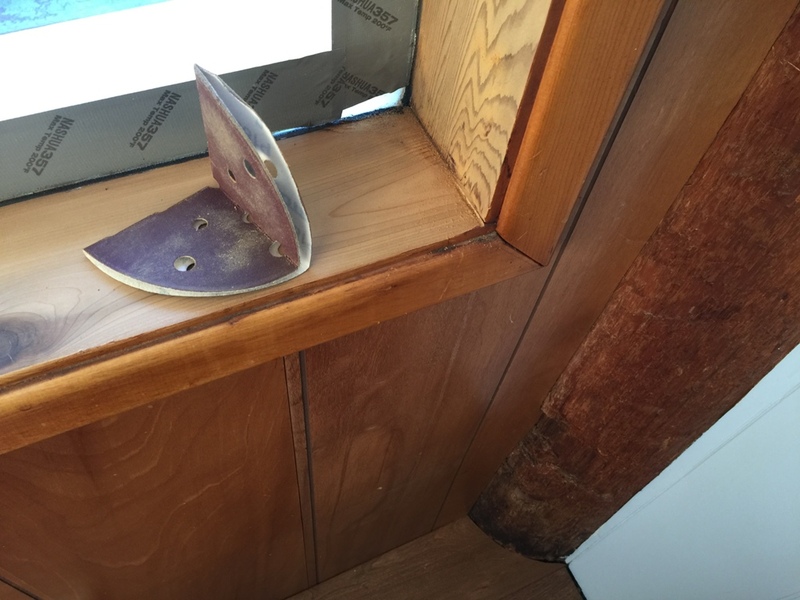 I folded this one up and used it to sand inside the corner that the sander could not reach. 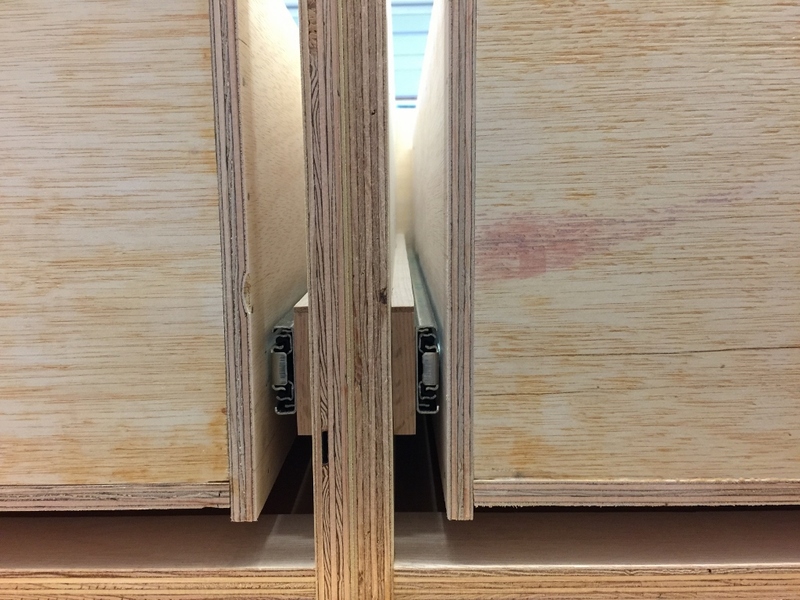 If you use dowels to plug holes, you probably know that it’s easiest when they’re tapered a little bit, that way they fit into the hole. Want a tool that does this for you ? Try a pencil sharpener. 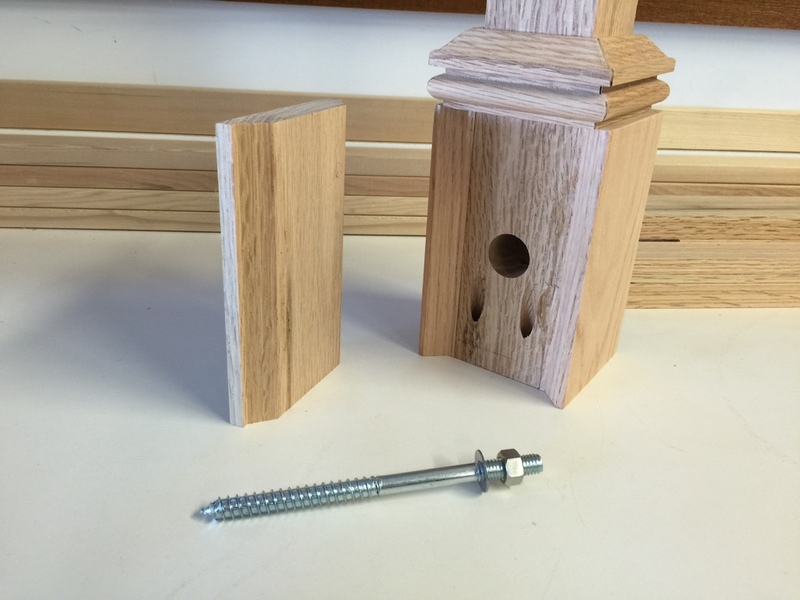 You can get a little hand held one for about $1 and it will very neatly taper your dowel plugs. You don’t need a fancy pants phone dock. 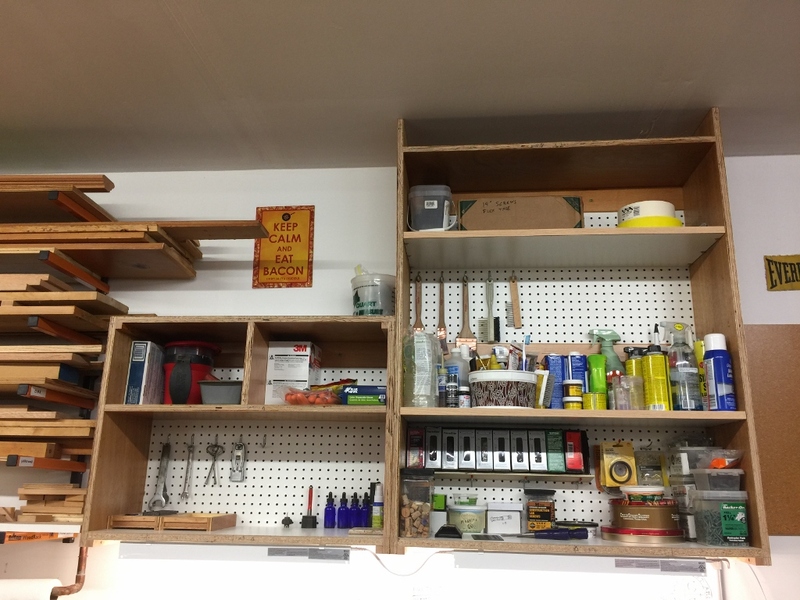 Two J-hooks on your pegboard will do the trick nicely. I drilled a hole for the charger. 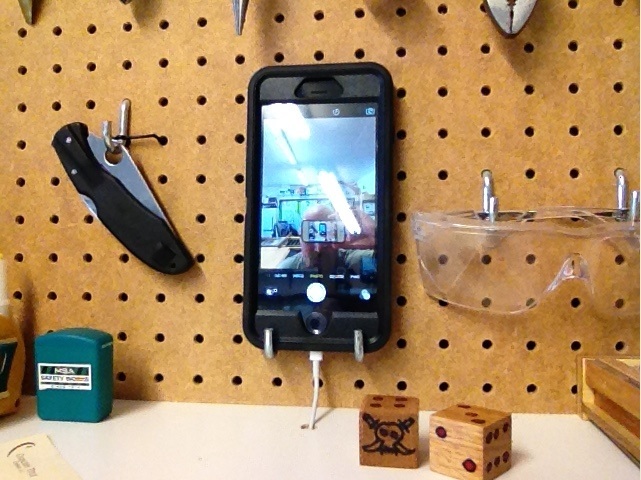 In my shop, the phone controls the music and it takes all these lovely pictures you’re looking at, so it’s nice when it’s in easy reach. 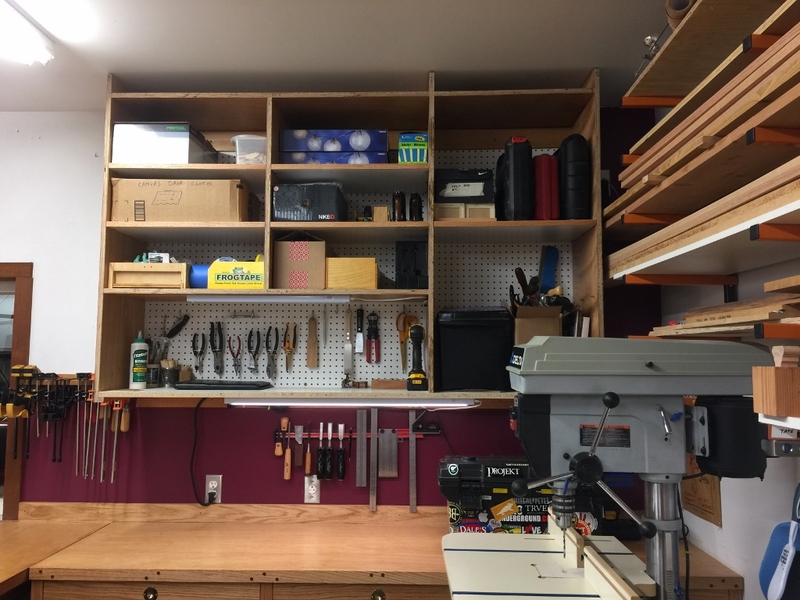 You’re going to own tools that you don’t have a use for except for very rarely. This is okay. When the circumstance comes up that you need it, you’ll be happy you have it. 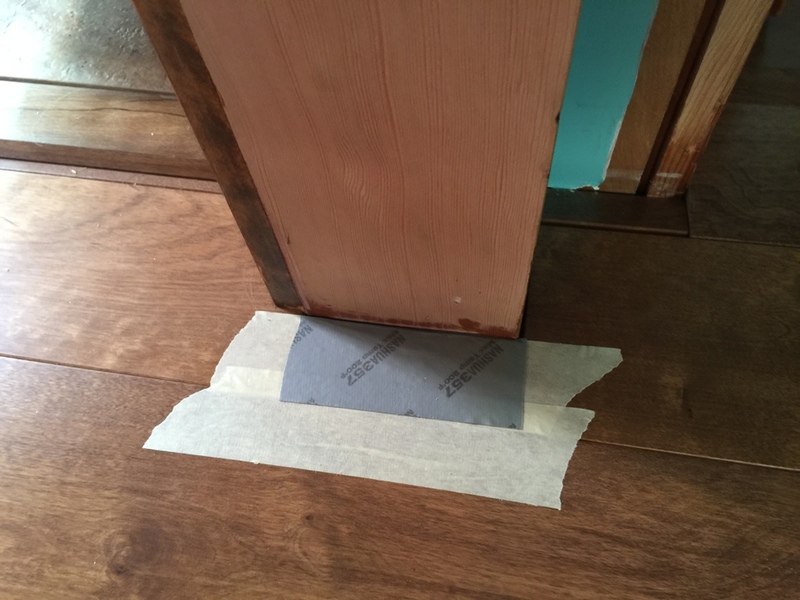 If you want to protect something with duck tape, but don’t want to risk ruining the finish with its strong adhesive, you can put down some masking tape and then put duck tape on that. 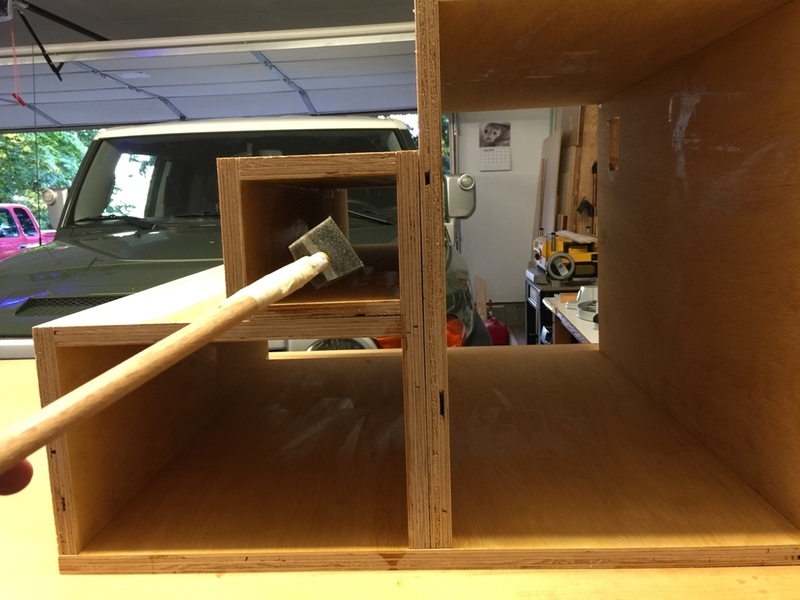 It will pull off the floor easily and won’t damage anything, and you can protect the floor’s finish from the edge of the sander. 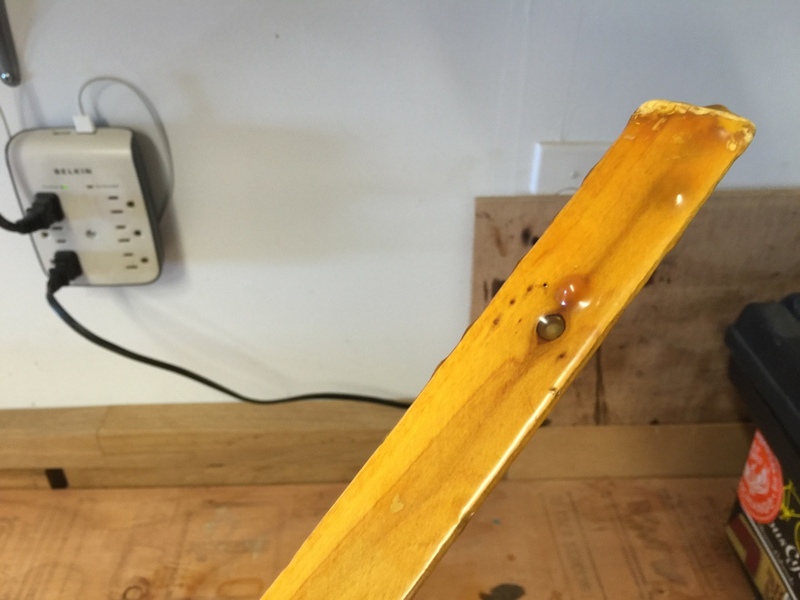 Don’t throw away your sponge brush until you’ve checked for drips. 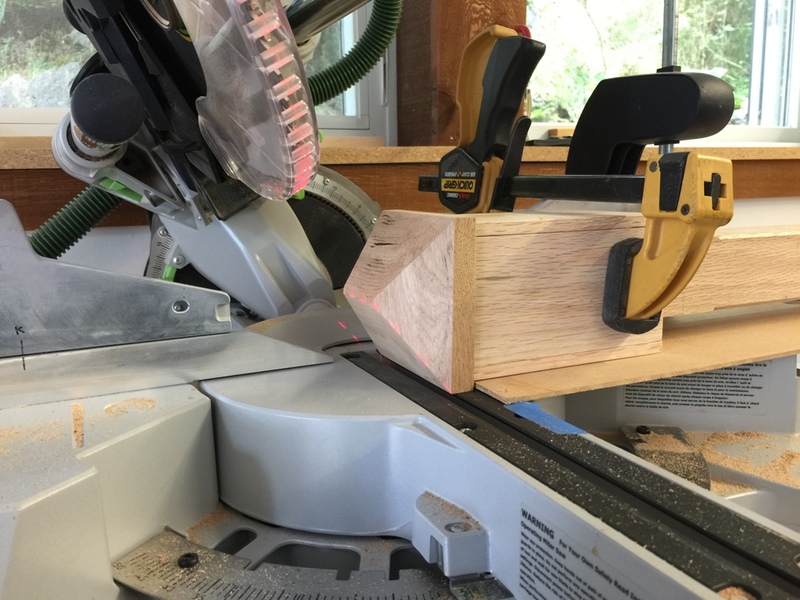 Saturate the end grain with as much polyurethane as it will absorb. 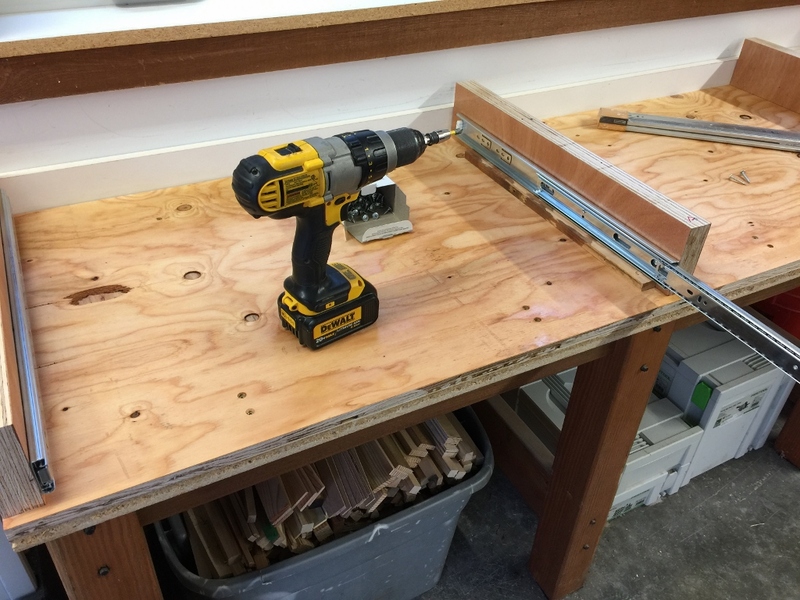 You’ll never regret pre-drilling your nail holes, whereas you’ll always regret splitting your wood if you didn’t pre-drill. 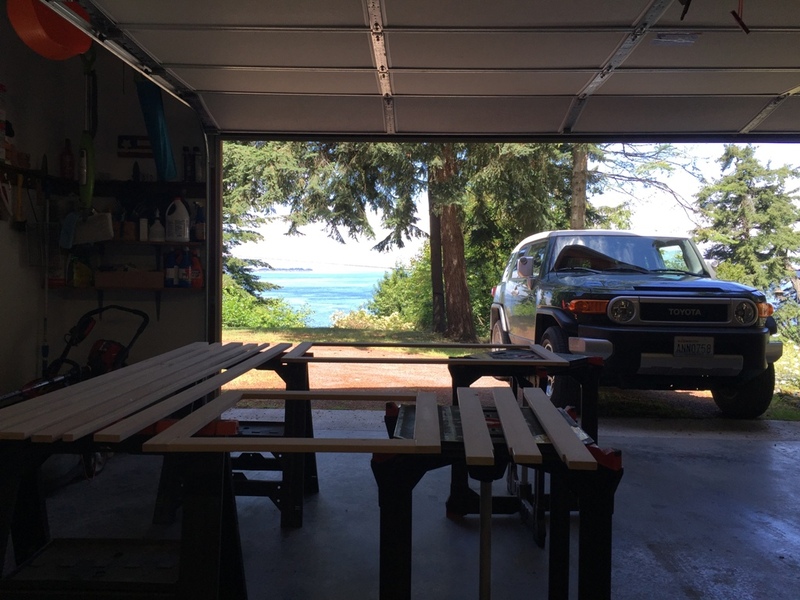 If you’re fortunate enough to have a nice view, be sure to orient your shop so that you get to enjoy that view while you work. I’ve used the same stir stick for polyurethane for like 15 years now. I now know what over a hundred layers of polyurethane look like. 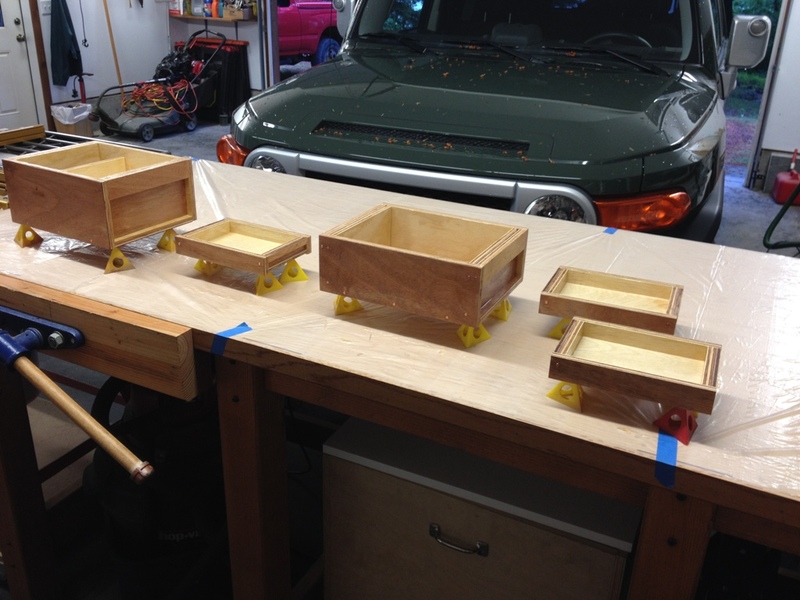 I also know the consequences of adding layers of polyurethane without sanding in between coats: nothing. It makes no difference if you don’t sand. It’s just a little lumpy, that’s all. 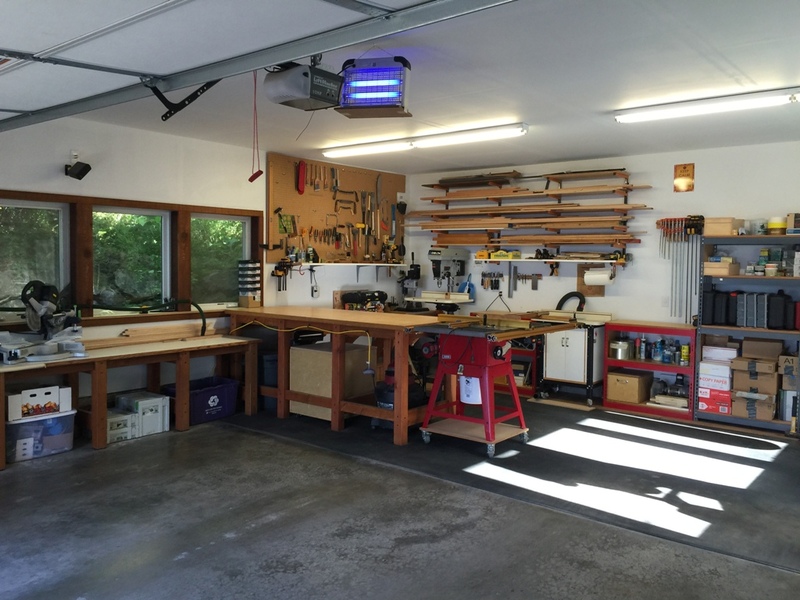 A bug zapper for your shop may be the best tool you buy all year. 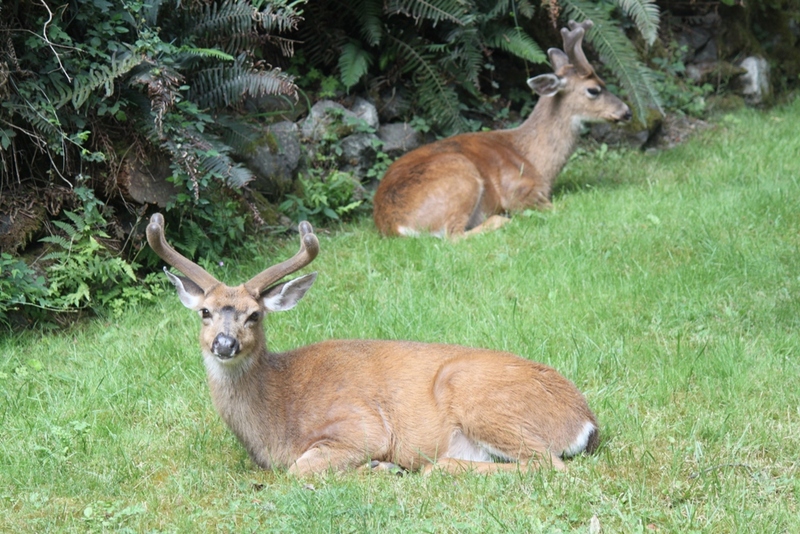 As promised, here’s two bucks. 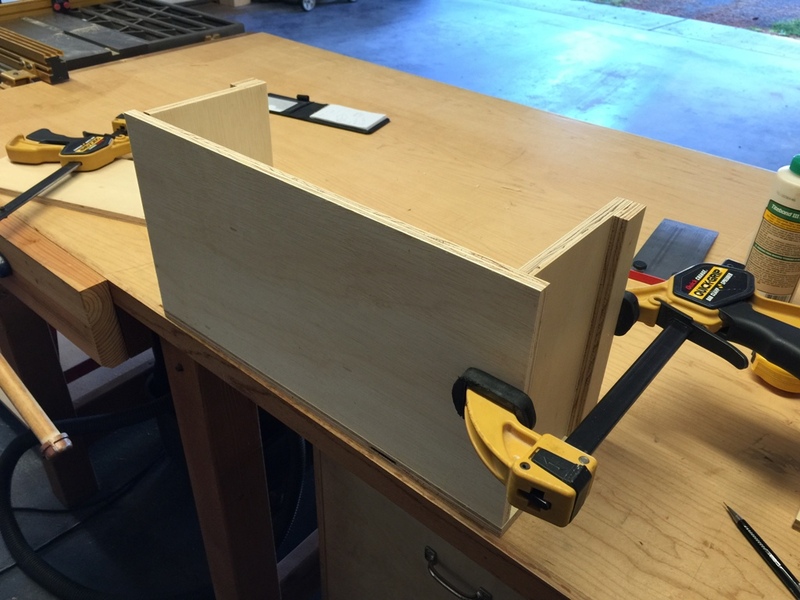 I’m really enjoying making these boxes out of scrap plywood! These are all storage/organizer boxes for places like under the kitchen sink and some small tool boxes for in the shop. I’m feeling a lot less disorganized now. Anyway, I’m enjoying making these so much that this may be what I (eventually) do for a living! 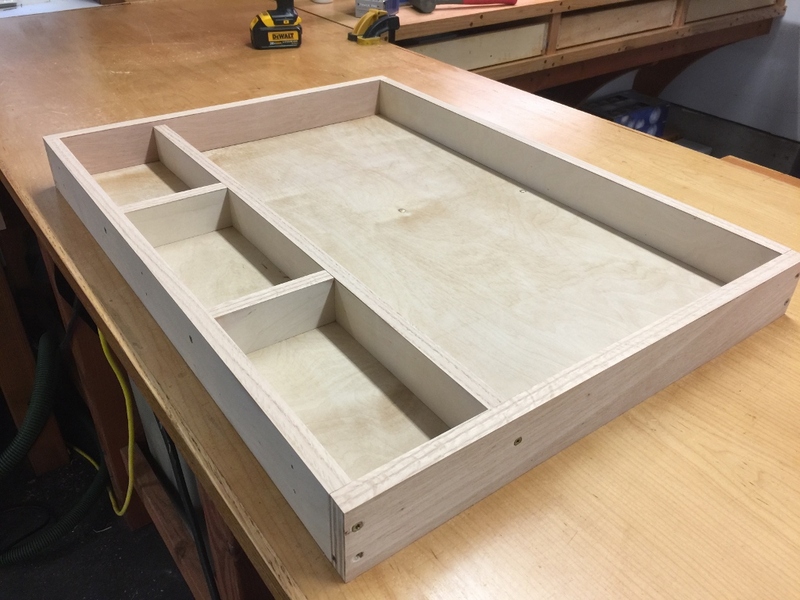 I’ll call it The Pirate Box & Crate Company, and I’ll make boxes for organization, for storage, and custom boxes of whatever size someone would need. We invest so much into plastic boxes and storage containers, and all that plastic either sits in a landfill or floats around in the sea and washes up on a beach somewhere. 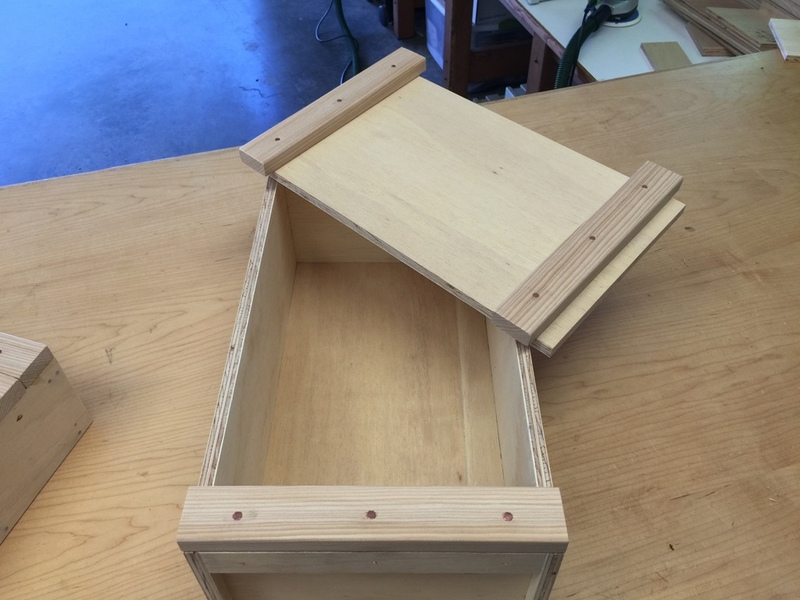 I think it’s a good idea to get back to some basic wooden boxes like this. They’re easy to make, and would be fairly quick once the process is streamlined. 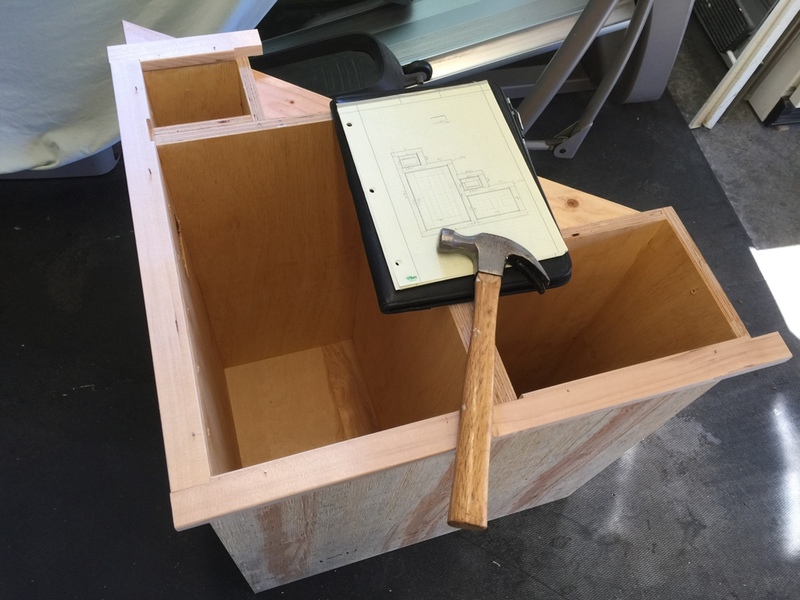 Here’s a chest I made for our hammock, when it’s not in use. And here I am assembling more boxes. These things are a cinch to make! 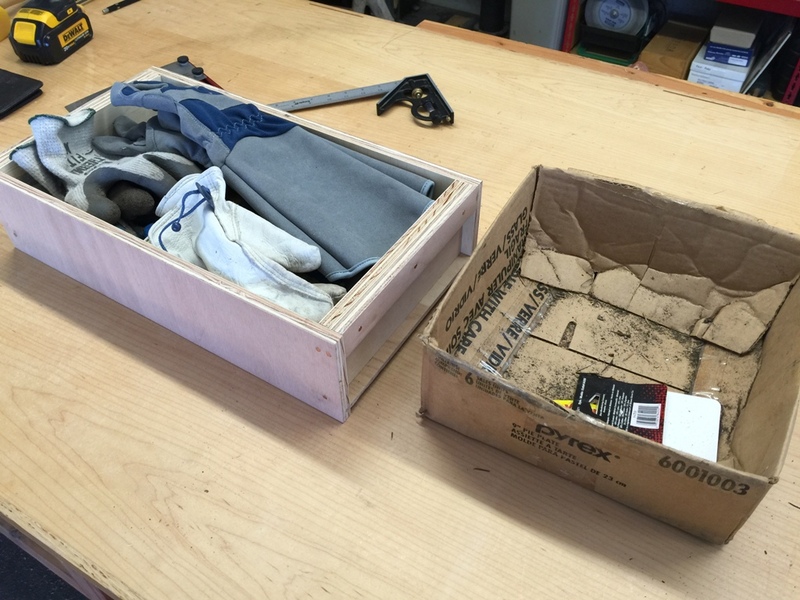 This box will replace a cardboard shoe box that housed odd and specialty drill bits and replacement blades, and has been falling apart rapidly for years. It barely holds together anymore. This box here will last decades. And it’s all made out of scrap plywood and some 1x2s that I had laying around. 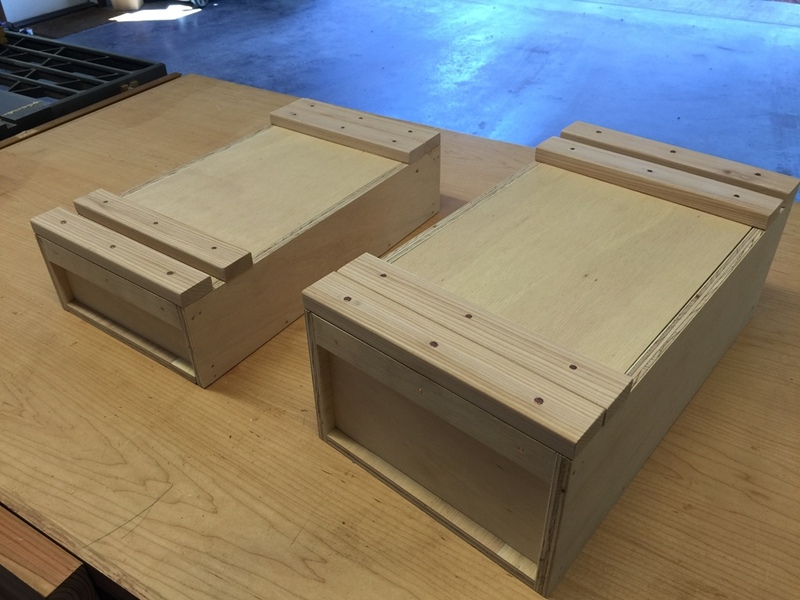 I designed the lids to these guys from the traditional Japanese toolbox, with a lid that slides into place. 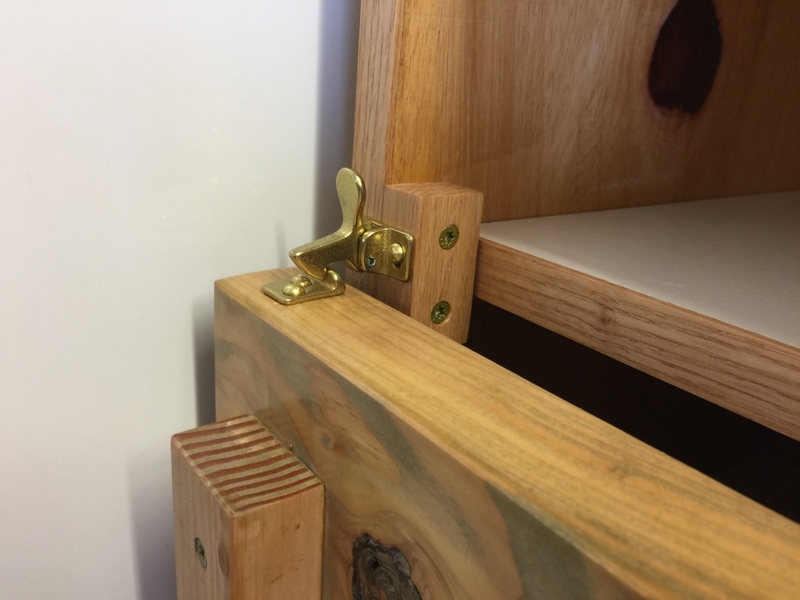 You can make them so the lid locks into place with a tapered piece of wood, but I didn’t see the need. Both boxes are going to be for things I access regularly, and they won’t really need to travel anywhere, so I can leave the lids loose on top of them. I’m enjoying this process more than I probably should be. These things are quick and fun to build. To the right is my old box of gardening gloves. To the left is the new glove box. How awesome is that? 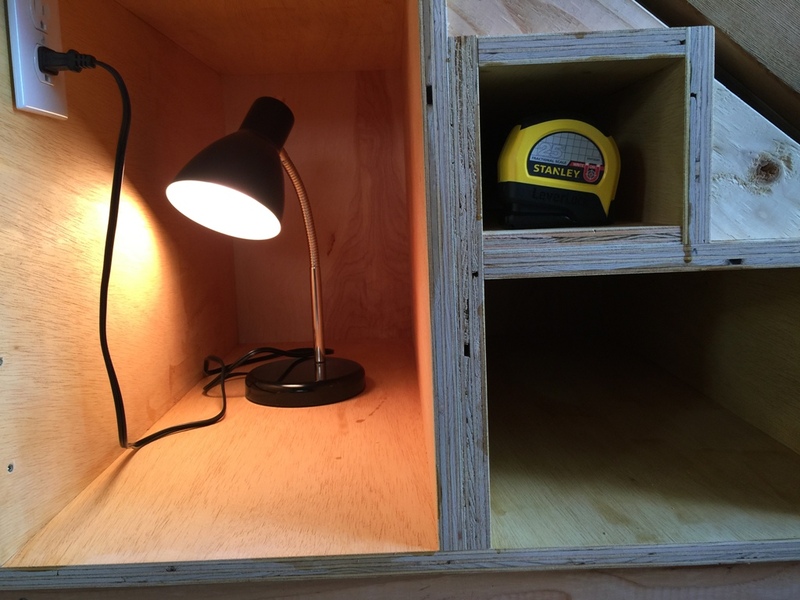 And I have got LOTS of scrap plywood left over to make more boxes. Going to make some bigger ones next. This is so fun! And yes, I totally get that my non-woodworker readers out there completely don’t understand any of this. Not a box, but a toothpick holder. Before this, I kept my shop toothpicks in a box made out of duct tape. The low tide today was 3 feet below sea level. It was surreal just to go down there and walk around on ground that is underwater for the vast majority of the year. 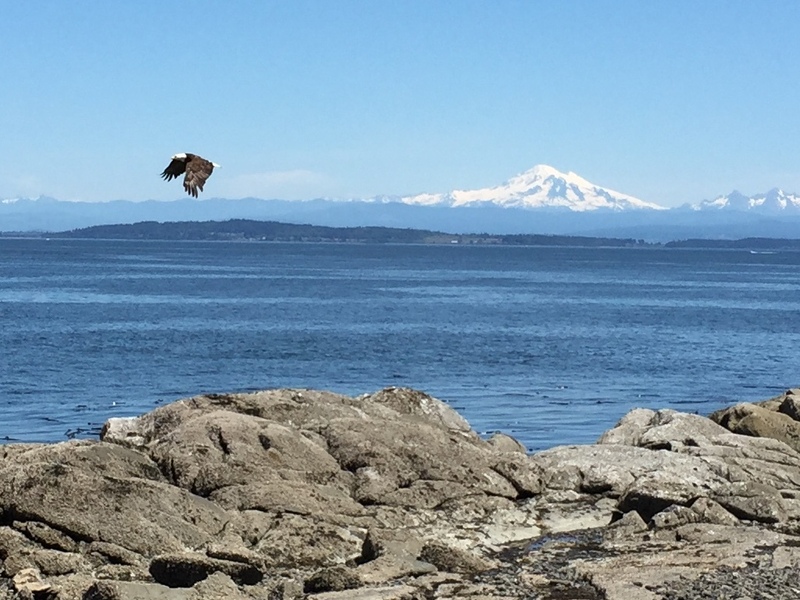 All manner of birds and critters were about, enjoying the newly exposed seafood menu.